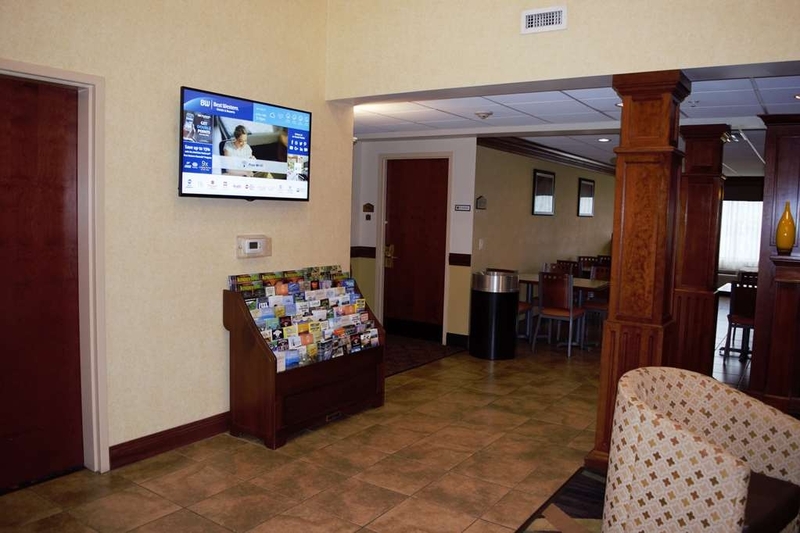 El Best Western Plus Strawberry Inn & Suites se encuentra en el centro de Knoxville. Venga y disfrute de las mejores atracciónes turísticas cerca de nuestro hotel. Precios bajos garantizados y ofertas exclusivas. 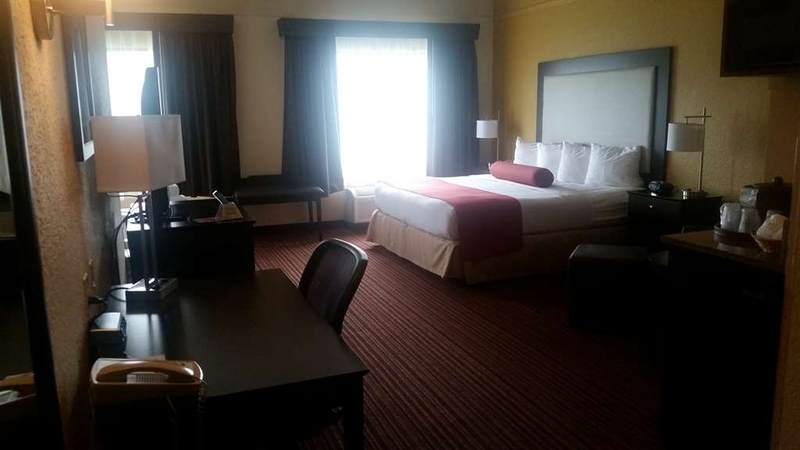 Disfrute de una maravillosa estancia en este hotel de Knoxville situado a solamente unos minutos del centro de Knoxville, la Universidad de Tennessee y las zonas turísticas de Pigeon Forge/Gatlinburg/Great Smoky Mountains. 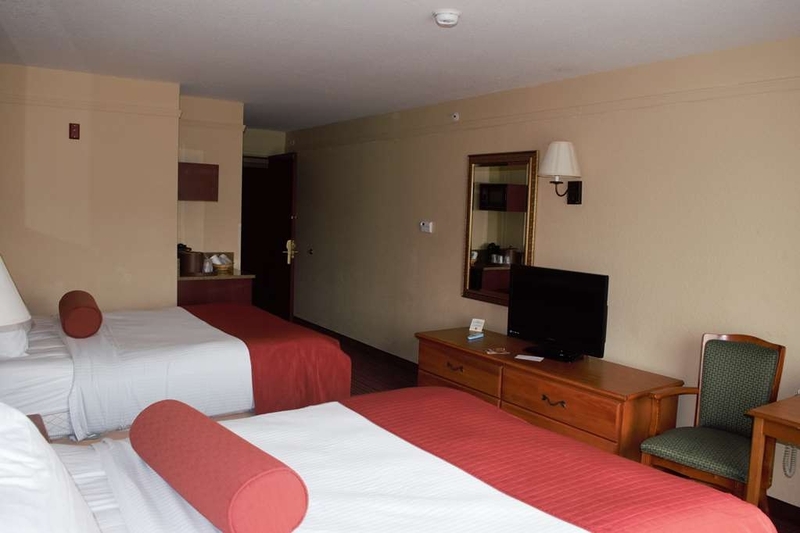 El Best Western Plus® Strawberry Inn & Suites goza de una estratégica ubicación a solo unos minutos de las atracciones del centro de Knoxville, como son el zoológico de Knoxville, la Universidad de Tennessee y el centro de convenciones de Knoxville. Nuestros huéspedes podrán disfrutar de una gran variedad de actividades al aire libre en el Parque Nacional Great Smokey Mountains. Los huéspedes del hotel también pueden disfrutar de las atracciones repletas de diversión del cercano Pigeon Forge y el parque de atracciones Dollywood. El Best Western Plus® Strawberry Inn & Suites ofrece sus servicios a huéspedes en viaje de placer o de negocios. El hotel ofrece un centro de negocios eficiente con salas de reuniones y servicios de congresos. Las habitaciones cuentan con acceso gratuito a Internet de alta velocidad, nevera y microondas. Entre otros servicios e instalaciones se incluyen un desayuno caliente completo gratuito con huevos, gofres recién hechos, salchichas y mucho más. El hotel cuenta asimismo con una fantástica piscina cubierta, un balneario y un gimnasio. 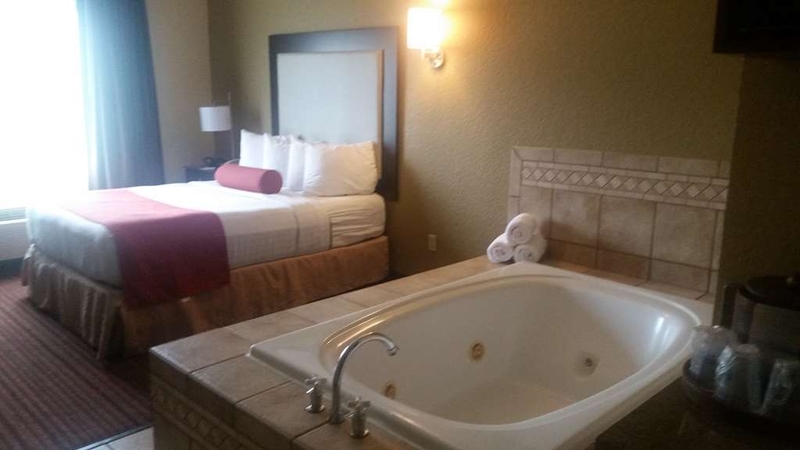 Si desea disfrutar de un servicio excepcional durante sus viajes, haga su reserva en línea hoy mismo en el Best Western Plus® Strawberry Inn & Suites en Knoxville, Tennessee. We always stay at the Strawberry Plains Best Western when we pass through while traveling and are never disappointed in our acommodations. The personnel are friendly and professional and always ready and willing to help. The hotel is convenient to the interstate. Nice location to Knoxville or pigeon forge if you don't want to stay in the crowd. The hotel was nice looking but had a bit of a odor threw out not bad but it was noticeable. pool was small but nice enough. We stayed in a Jacuzzi suite room was neat and had easy access to the parking lot. "Nice stop in a good location"
This is a nice place to stay . The staff is friendly, the location is good. Its a quiet area to get a good nights sleep. There are good restaurants nearby and you can get a discount,but be sure to ask the front desk . The pool and spa and workout area is very nice and kept clean. The rooms are nice and clean as well. 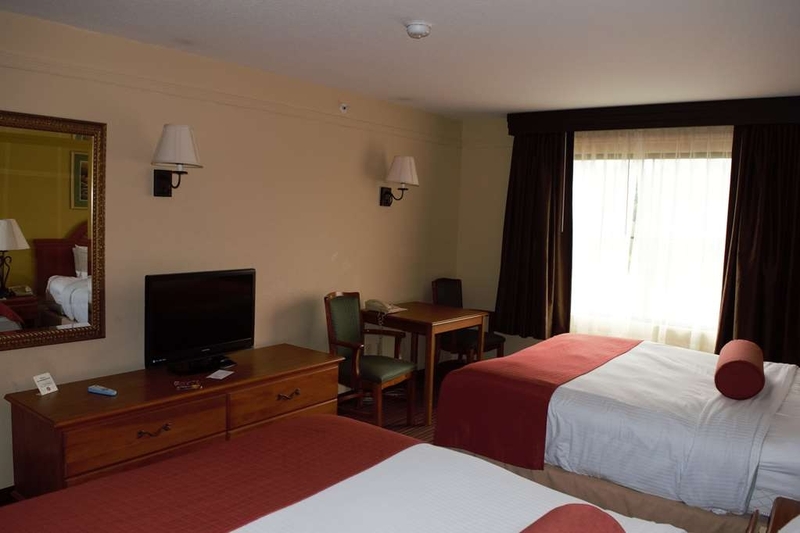 "Nice clean reasonably priced hotel"
Nice comfortable rooms, clean and well maintained. Bathroom is a nice size with good counter space. Convenient location easy access from I-40. In room fridge has a freezer secion, this is becoming rare. Over all a very pleasant stay. The bed was very comfortable. Everything was very clean Lots of counter space in the bathroom. The staff was very friendly and helpful. Desk clerk was very helpful recommending local restaurants for dinner. Nice freindly staff, pleasant hotel. Convenient to get to from I 40. We enjoyed our stay, nice clean spacious room, everything was as it should be. We will stay here again next time we are in town. This property has been updated. We were pleased with the friendly staff, clean room and comfortable bed. It is a good location for nearby restaurants for lunch or dinner. The downside was the breakfast; the coffee was weak and food not very good. We still recommend staying here. "Clean hotel with friendly staff!!!" This hotel exceeded our expectation. The rooms were very clean ,so were the bathroom. Bed was very comfortable to sleep which is very hard to find while traveling. Breakfast was really good and lot of varieties. No one will ever go dissatisfied from this hotel. The staff were very friendly and courteous. Will surely come back!!! We arrived at the BW Strawberry Inn and were quickly checked in. Room was comfortable and clean. Toliet seat was a bit loose but we managed. We did need to contact the front desk around 11:00 p.m. to report a noisy guest above us (apparently a youngster expending some energy). The problem was quickly solved and the elephant stomping ceased. I highly recommend the Italian restaurant in the front of the hotel - excellent food and service plus you get 10% off your bill if you're a quest at BW + Strawberry Inn. Thank you, I'm glad you enjoyed your stay with us. Rooms were clean, staff was friendly. Breakfast wasn't that great, standard scrambled eggs, shriveled sausage links, pastries, waffles, the usual, but the biggest turn off for me was the little packs of “butter spread,” would it be so hard to offer REAL butter? Also, instead of offering real strawberries (even if they had been previously frozen,) they had the nasty strawberry glaze that supermarkets sell to make strawberry pie. Ugh. The very worst part of the stay, however, was the “indoor heated pool,” which was freezing cold.....in November. Will not be returning. I can't say anything bad about this hotel. It was clean, attractive, just off interstate, and near pretty much everything. King suite was spacious and appeared recently renovated. The breakfast was hot and the choices plentiful. Indoor pool nice and clean and the exercise room more very well equipped. However the shine star in it all was Laura, the manager. A problem solver with a great upbeat attitude. She gets an A+. We'll be back for another Vol's game. The Strawberry Inn is easily accessible on and off the Interstate. Like every other Best Western Plus we've stayed at, the hotel lobby is beautifully decorated, the room was clean and well appointed, the staff was welcoming and helpful and the full breakfast in the morning was economical (free) and excellent. There is an excellent Italian restaurant right next door and other fast food options if you're in a hurry. This was the 4th Best Western Plus we stayed at during a 5-day cross country drive with a moving truck. They were all superior. We used the hotel for an overnight stay and were very happy with the cleaness of the room and friendliness of the staff. Breakfast choices were great and the gentleman helping with breakfast was kind and helpful. "Great clean hotel with a wonderful free breakfast!" Hotel stay was very pleasant. Rooms were very modern,clean, quite and nice !! 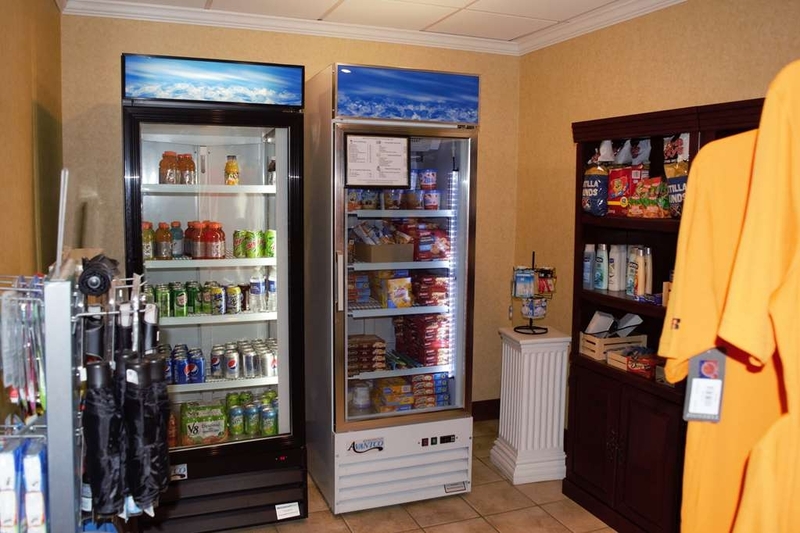 Clean linens, friendly staff, free breakfast, vending machines on our floor worked well with nice selections. There was a slight odor maybe smoke but not bad, otherwise great. Would definitely stay here again!! Thank you and hope to see you again. Well appointed and maintained property, in an ideal location next to I-40. 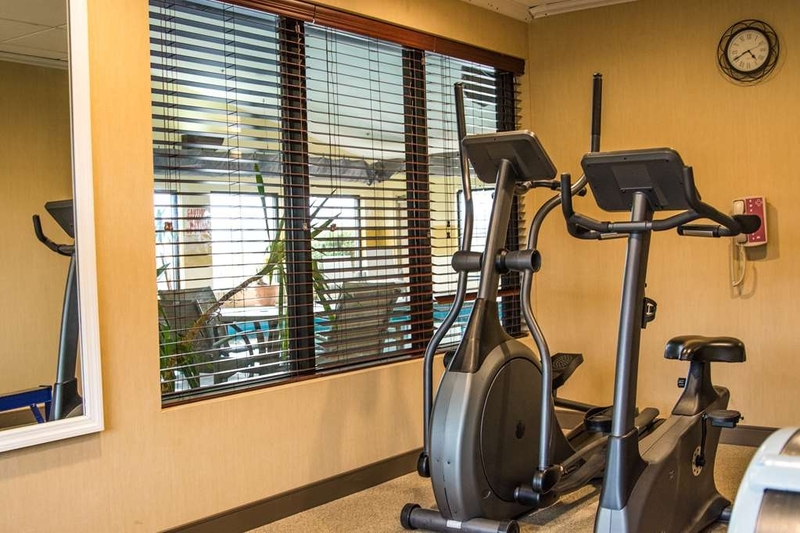 Great breakfast, Fitness Room, and Indoor Pool. Lots of local eateries. Staff was professional and very pleasant. One of the Best of the Best Westerns in the Southeast! The staff were very pleasant, the breakfast was fine, the room smelled of smoke. It did mot seem like recent smoke, but the smell leftover from when a room has been a smoking room. We were able to sleep and the smell was subtle, so we did not do anything anout it. This was the second night in a Best Western (in another state) and both had the same problem. "Good except for AC Temp"
Very nice room and breakfast for the price. Only problem was the AC, it had a wall thermostat that was not regulating the temperature well at all. No matter what temp I tried it was either too hot or too cold. Thin blanket didnt help. I apologize and I will check the thermostat. Again I'm sorry. "Would never stay here again"
The worst Best Western Plus I've ever stayed in (and I travel a lot). On a parking lot we were approached by a shady character who wanted to wash our windows and demanded money. When we mentioned it to the reception, they said it's totally normal. They gave us a room that smelled like smoke which made me have an allergic reaction. There was a mix up with our reservation and supervisor Laura refused any action. I hope Laura us reading this. She singlehandetly lost a customer for the whole Best Western corporation. A simple act of kindness and common sense would bring your company $$$ in the future. BAD BUSINESS DECISION!!! 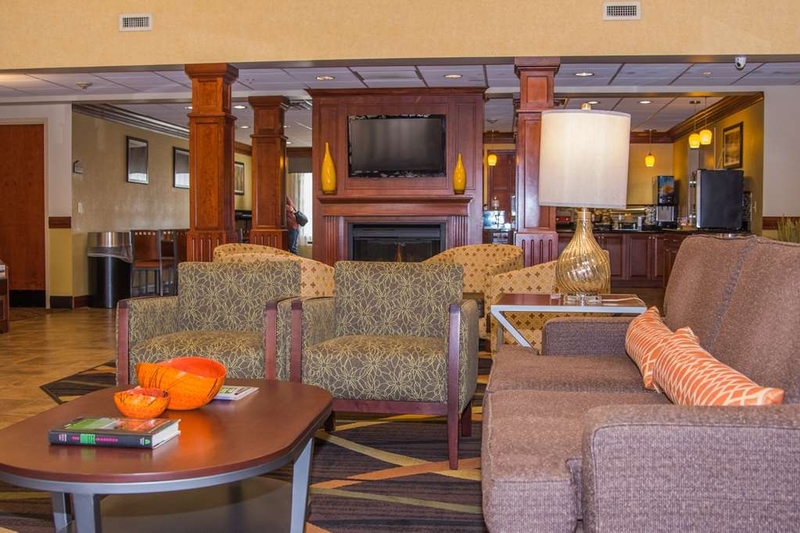 This Best Western Plus is a fine hotel for most people. Unfortunately I'm not one of those people. I stay in a hotel to relax and sleep. The fact that I'm writing this review at 2:30 AM should tell you about the sleep quality. The bed isn't particularly comfortable and there is no easy chair in the room. The chairs near the table are narrow and uncomfortable. The staff brought up a chair without arms so I could at least sit down someplace other than the bed. If you are small and in good health I guess this is a good hotel. We stayed here for one night. It seemed to be a bit of a tired facility. The room was clean and spacious enough. The breakfast was ample. The staff was friendly. The price was right. The most delightful thing about the hotel was the hostess in the breakfast room who was incredibly friendly and seemed to be genuinely interested in all the guests. We were traveling through when we decided to stop here. Good choice! We didn't have a reservation and arrived about 7:30, but there were still rooms available. Friendly front desk person. We told him we are both light sleepers and requested a room away from an elevator if available. He said no problem and gave us a nice room on the top floor at the end of the hall. The room and bathroom was clean, the A/C worked fine, the wi-fi was not the fastest, but not bad and it stayed connected. Decent breakfast with good coffee. No problems at check-out. Very reasonable room rate. We have this hotel marked so when we come back through, we'll stay here again. "One of our favourite Knoxville hotels"
We stay here often when in transit to SC or Florida from Michigan. Very friendly staff. Clean room and spotless bathroom with REAL towels!!!!! Breakfast area is small but clean and very neat. Food selection was good and staff very helpful and friendly. Bed comfortable and A.C.worked well. Quiet area and convenient to Highway 40. Overall a very nice place. When we arrived our room wasn't ready. They were just finishing it up. This was after the 3 o'clock check in time. The room was nice, my wife's went into the bathroom and noticed hair behind the toilet and the shower curtain wasn't changed out. The Continental breakfast was your standard BW breakfast. They corrected all the deficiencies and apologized. We would return again. We were a short distance from Gatlinburg and pigeon forge. "Very nice stop in the Knoxville TN area"
We were traveling from Myrtle Beach SC to Louisville KY and stopped for the night in Knoxville. The Best Western Strawberry Inn & Suites was a VERY nice stop for us. The hotel staff was friendly and recommended a great restaurant - and gave us a coupon for 10% off our meal. Hotel rooms were clean, modern and comfortable. We enjoyed a great breakfast - lots of selections. Would definitely recommend! I'd stayed the previous night at a BW Plus in IL for about $40/less per night and, by comparison, found this BW lacking in a few areas. The essentials were there: clean, quiet room, enough businesses in the surrounding area that you don't have to go far to get provisions or dinner, easy on and off from the highway. The hotel is in a large plaza that also included Cracker Barrel, Burger King, Puleo's (which advertised Steak, Seafood and Italian) and a couple of gas stations and convenience stores. The pool was smallish- you might have been able to swim laps in it. I used the gym and at one point someone came in to get towels because there were none in the pool area. The gym equipment was functional but dated; no cup holder on the elliptical trainer and if you got off to get a towel the machines turned off and your settings were lost. The gym could use a water cooler. Breakfast selection was average- a BW I stayed in the previous night had a bigger selection. Room was average; it did include a refrigerator and microwave and was very quiet since it didn't face the highway. We enjoyed our stay at the Best Western. We booked 2 rooms--a King suite and a family suite. The king suite had a king bed, a pull-out couch, mini-fridge, microwave, and coffee maker. The family suite had a 2 queen beds, a pull-out couch, mini-fridge, microwave, and coffee maker. Both the living and bathroom spaces were generous. The hotel also has a pool. The stay also includes free breakfast in the morning. This is a standard hot breakfast--eggs, meat, potatoes, make-your-own waffles, oatmeal, coffee, etc., with a variety of cold items, baked goods, yogurt, etc. I was happy to see that there was almond milk offered, in addition to traditional dairy. At check-in, the front desk worker was so welcoming, answered all of our questions, recommended nearby restaurants, and made us feel at home. While both rooms were visually in good shape, the king suite has the faint smell of stale cigarette smoke BUT the family suite did not. The smell was not in the linens or couch fabric. The odor seemed to permeate from the room/walls itself. I wonder if certain rooms used to be smoking allowed before BW became a non-smoking hotel. I raise this issue for any traveler who deals with smoke allergy or asthma. You may want to "smell" your room at check in to see if you'll need to request a different one. Again, the family suite we also book smelled super fresh, clean air, and NO hit of smoke. I only found this in the king room. For dining options, there are both fast food (KFC, etc.) and full restaurant (Puleo's and Cracker Barrel) options. The BW gives out a 10% coupon for Puleo's; you can walk there from the hotel. We enjoyed our stay. The location was super convenient. We stayed overnight both going to and coming back from Kentucky. It's very easy to find and there's an incredible restaurant within walking distance. The one drawback is the bed, which was WAY TOO SOFT! I slept in the chair both nights. "Not Up To BW's "Plus Standard"." We stayed at the BW's Strawberry Inn for two nights while visiting relatives in the immediate area. The front desk receptionist was friendly when checking. The hotel appeared to refurbished and we were told that most of the furnishings had just been replaced. It was very attractive. The bedding was very good and the bath appeared to be clean and fresh. My wife and I noticed that while walking in the room our white socks turned black on the bottoms. The dark carpet "looked clean" but needed to be steam cleaned....Room 105-A. Not up to the BW's Plus standard. The front of the hotel is brightly lit and the draperies don't block out that ambient lighting. The refrigerator and microwave were excellent additions to the room. All of the Best Western Plus hotel properties that we have stayed in recently have been exceptionally clean and well-maintained, and the staffs have gone out of their way to be helpful. The hot breakfasts at each property has been terrific. The food is well-prepared, varied, and very tasty. In each case the employee in charge of the breakfast has been exceptionally pleasant and efficient, keeping the area stocked and spotless. Kudos to management for energetic and motivated employees and excellent maintenance. Our mission group made an overnight stop here and had a great night's rest, followed by a great breakfast to start our day! Quiet, safe, easy to find! Our rooms were clean, with comfortable beds, refrigerators, and microwaves. "Like sleeping inside a light bulb"
I arrived at the hotel after driving 8-hours. The check-in experience was not pleasant. There was one person at the counter when I got there. Twenty minutes later, I finally got checked-in. I was on the first floor. That night, even with drapes fully closed, a flood light outside my room pretty-much illuminated my room all night. It was far too late to change rooms, assuming there were rooms available. It was a standard no-frills room, clean and comfortable, until I turned the lights out. Breakfast was so-so. The "scrambled" eggs were actually soupy. 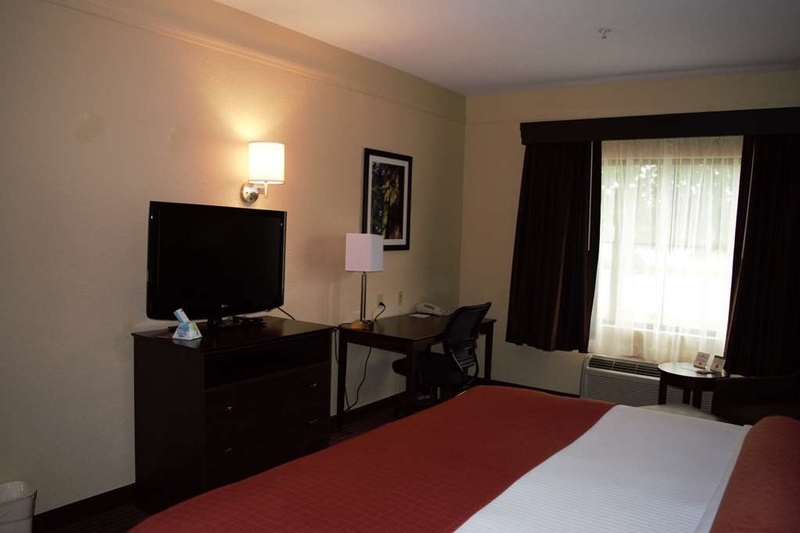 I've stayed at other Best Western Plus hotels and was completely satisfied. Hopefully, this was a one-time experience. "Just a one night stay"
Overall, great visit. The Strawberry Inn is clean, quiet and conveniently located. I got into a little fight with the just barely big enough shower curtain, but that was mostly a personality conflict. Breakfast was small but well put together. Cereal, toast, sausage, eggs, that sort of thing. Oh, and biscuits and gravy. Well done again, Best Western. "Wonderful room! Clean, well appointed!" "Great, Great place to stay"
This is a great place to stay. The staff were very friendly, they gave us some great tips on where to eat. 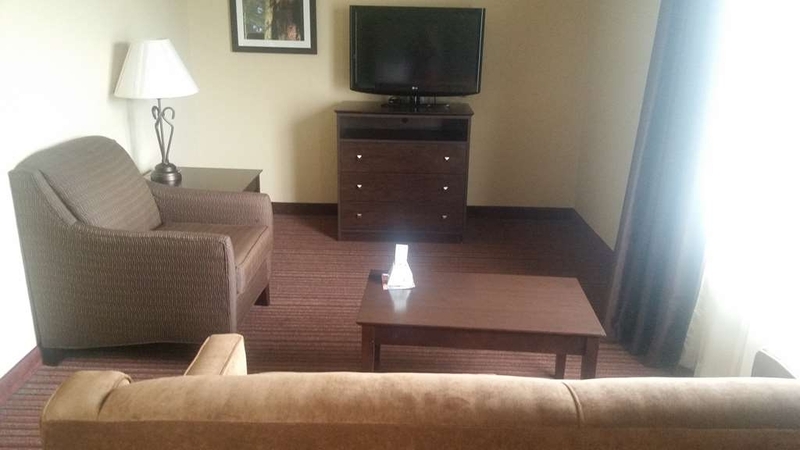 Very roomy suite with great décor. Breakfast was good and the coffee was not too strong or weak. Nit horrible, but nothing to write home about. Two things in our reservation were incorrect. They claim my reservation said 2 queen beds even when I showed them a printout of my reservation which said King Smoking room. and yeah, the hotel no longer has any smoking rooms. one of the reasons I chose this hotel was because they said they had smoking rooms. The staff did not offer to rectify the problem with the wrong room, only offered to cancel my reservation. Checked in after a long day of travel. Signs posted on the door stating sold out but I had a reservation. Checked in, got to room only to find that it reeked of cigarette smell even though it's advertised as no smoking. Went back up to counter and asked to change rooms but was told nothing else was available. No refund due to booking made thru Expedia. The clerk could not have cared less, let me know that a construction worker had been in the room for the last 3 nights (?) and there was nothing that she could do. I contacted Expedia to cancel reservation at no charge and I moved to a LaQuinta 3 miles down the road, saved $50 and was treated like a guest. I spend many nights on the road and this hotel has been blocked from future booking. Heading to Houston, Tx by car. First stop is Best Western Plus Strawberry Inn & Suites, Knoxville, TENNESSEE. One night, conveniently located off highway. Highly recommend. Very clean looking and smelling. Nice breakfast. Great staff. A very good choice. The pros for this hotel are comfortable beds, friendly staff, and quick breakfast. The cons are terrible pillows and a really bad television. Picture was actually fuzzy. Overall a fine overnight stop. Great welcome by Lynne the Receptionist, she was excellent in every way in sorting out the lovely room. (Even mimicking my English accent in a very funny way.) 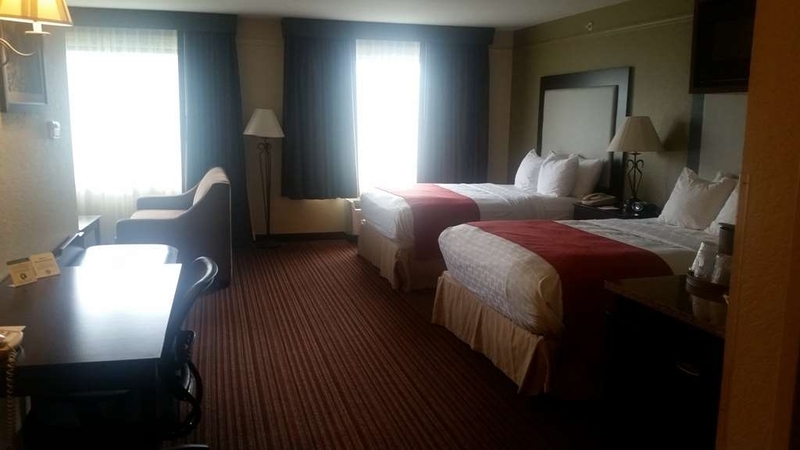 Really enjoyable stay in this Hotel which is well situated for visiting Smokey Mountains. Great value, super Hotel and friendly staff. We arrived late at night. Sink in room didn't work. I had to request a new room after waiting for an hour for someone to come fix it. Now it is 11pm. New room smelled of smoke and pretty sure the sheets were already slept in. At 3am people running in the halls and showers were started. 3:30am a contant running of a toilet with spraying water every 30 seconds. It continued all night long. I recorded this showed the front desk. The woman said to me "maybe people like water running all night'? The place is under renovation. Carpet was ripped up and new carpet was lying in the halls. Fresh paint all over the 3rd floor. Spa was closed. I will NEVER return to this hotel. Lots other hotels at Strawberry Hill, skip this location! Stopped overnight on our way to SC; we expected this to be a hotel that fit that bill. We had no illusions that this would be a high-end stay. We did, however expect this to live up to 'Plus' criteria for BW. As a perks hotel for Harley Davidson riders, we've stayed in a number of BWs over the years. Some are good, some are not. This one is not. Front desk clerk was rude, and we are convinced that she intentionally put us in a room next to screaming children (the Mom was happy to join in as well). This was also a smoking room, and it was assigned to us without asking if this was ok. The room smelled like stale cigarettes and rotten cucumbers. The air conditioner/heater was temperamental at best. Coffee was incredibly weak and lukewarm, and when I asked the morning clerk if we could have some I was barely acknowledged. I could not have felt less welcomed, and this was the second hotel employee to react this way. I was charged $15 for incidentals that we never used. The one bright spot was the shower, and the fact that someone had actually tried to clean this hotel. It is the pits. We were in the hotel less than 8 hours, and it was truly terrible. We were exhausted from being on the road all day, and needed to be out before 6 am to keep up with our travel schedule. We were simply too tired to deal with the front desk and ask for another room. I opted instead to leave this review. There are many other hotel choices in this price-point. Don't waste your time or money here. This hotel is not a place we would ever stay again. The room was not clean and the bathroom needed repairs. We travel with our dog and they told us they had one room for pets and there was a $15.00 fee per night. When we were there, there were 2 other dogs in the hotel and the staff said it they did not know. One staff member told us it was a work dog, but that was not true, because we are familiar with work dogs. We don't mind paying a fee for our pet, but this is not fair. We were supposed to stay for 3 days, but checked out after two days - when the bathroom problems were not fixed. The hallwalles stink of smoke even though its a smoke free hotel, the rooms are dingy and stink of sweat and the sheets are old and have stains. This place need a demolition and rebuld. Stay away until that happens. "More hassle than fun for our family"
The promised Roll-away we needed to have our family of 5 fit in one room was unavailable upon arrival, and the employee was unable to problem solve. She said it should not have been promised to me and it was not her fault. Her solution was for us to pay for another room, but she said she wasn't authorized to discount it. She suggested we go else where. With everything booked up on New Years Eve, we were stuck! One of our rooms had a dirty sock in it and both only blew cold air from the register- we couldn't heat them to a comfortable temperature and all 5 of us froze at night. I was willing to compromise and figure something out, but after a 12 hour drive- I was met with attitude and a serious lack of ownership for the problem. "I'm sorry, but it's not my fault", doesn't fix the immediate issue at hand. Just hassle at the Strawberry Inn in Knoxville! 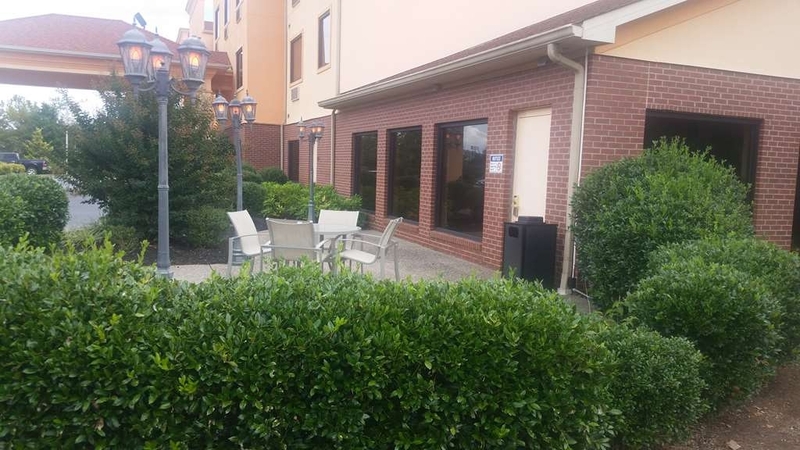 "Very nice, well worth the stay"
Very good location close to the interstate with restaurants close by. Outside of hotel looked clean and well cared for. Inside was also clean and neat. Our room was clean and comfortable. The breakfast was good and the regular items, what we need to start our day. I would stay here again if in the area. I also would recommend this hotel to anyone. "Stay at Best Western, Knoxville, TN"
We stay at this Best Western every yr when we come down to TN for the poultry show in Dec. It has great staff, and the hotel is very clean. We area family of 5 and the rooms are spacious for everyone to be comfortable so that we are not feeling crowded. The pool is clean, fun and the hot tub is a welcome bonus for us adults to soak the long drive away. This trip we asked for a roll away bed which was provided and in the room before we arrived. The only complaint we'd have is the roll away needs an updated mattress, it is a bit worn and uncomfortable. Other than that, we will stay here again when we come back for the poultry show next yr!!! Beautiful hotel, clean, fantastic indoor pool with a hot tub. The beds sleep like a dream. The room we had was a suite and it was huge. I have stayed at other hotels that rooms were not as large and cost more. We only stayed one night but I have already recommended this hotel to two friends. We stay here twice a year, and is our go to property in Knoxville, but on this trip we did not have hot water until the next morning. For a BW+ it was disappointing to say the least. We will not stay here again! "WAY overpriced for what you get!!" My first visit here was sheet perfection and it won't be my last visit room was spacious with large tv, comfy bed, extra furniture and big bathroom. Breakfast was delicious; hot and cold selections! Loved the hot tub!!!! Indoor pool was a little chilly for me but the hot tub temp was perfect and not too hot. Friendly and helpful staff! Clean rooms. This should be a 5-star Hotel!! Had a King Suite which had a sofa. Plenty of room. Easy access to I-40 (close however no noise from interstate). Had indoor pool. Was able to check in early which was a plus had plans to visit with a friend for the afternoon while in town. "BW Plus Strawberry Inn and Suites"
We would definitely stay here again. The rooms were clean and bed comfortable. The staff was friendly and helpful. The breakfast was very good with a good selection. If you are in Knoxville this is the place to stay. Very quiet. Close to restaurants and very friendly staff. Mattress was one of the most comfortable I have ever slept on. Close and easy to get back on the expressway yet remarkably quiet to be so close. "Good hotel for a brief stay in Knoxville"
There were three of us staying in the room, and it was big enough to accommodate us all. The beds, including the sofa-bed, were comfortable. The room was clean and had all the expected amenities. WiFi signal was strong everywhere. Parking is free as well as the buffet breakfast. I can definitely recommend this hotel. "Always a pleasure to stay here "
This has become our favorite stop on our ride home from visiting our families up north. We've never had an unpleasant experience here, nor any problems. 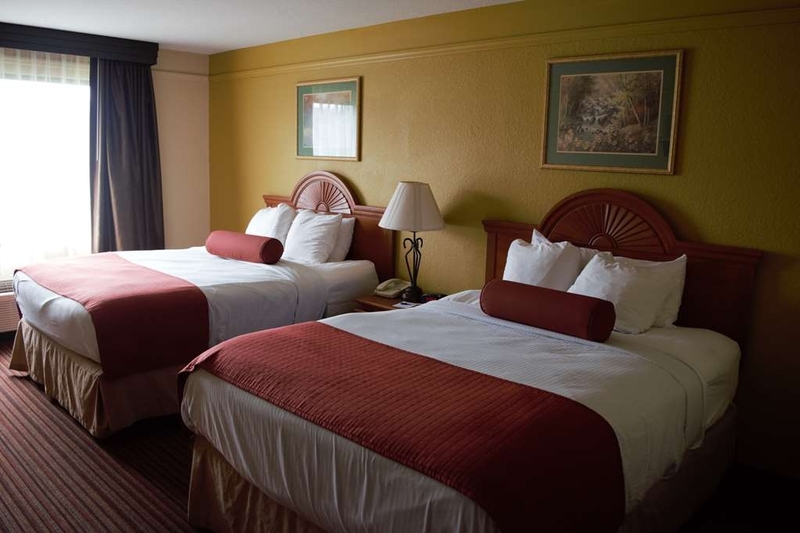 The beds are extremely comfortable and our rooms always clean. Perhaps a stain here or there but to be expected when accommodating thousands of assorted travelers. 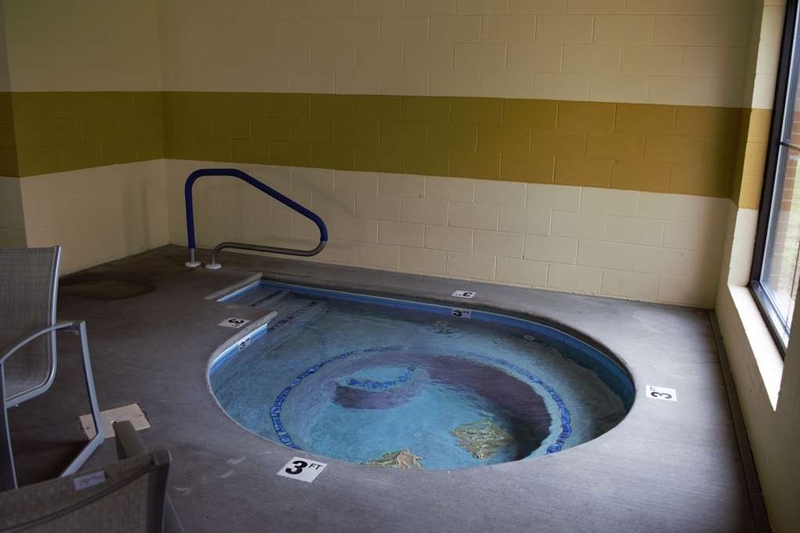 We enjoy the hot tub which is next to a small indoor pool. The breakfast area is kept immaculate and there are plenty of options for either a cold or hot breakfast. We'll be back next visit for sure. "Good experience for our family!" Good hotel, great hot breakfast with usual meat, eggs, and biscuits/gravy in addition to usual carbs and fruit. 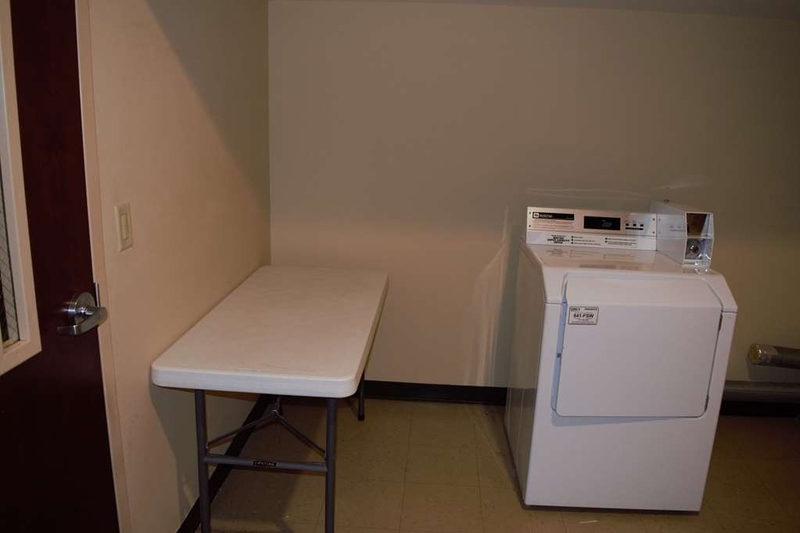 We got an end suite that was large, clean and in good condition. No complaints. Roads are slightly tricky to get there but it was set back from the highway behind lots of restaurants so not too much highway noise. WiFi was problem free; did not use TV or any other equipment in room. Rooms on backside of hotel overlook a large field. We'd stay there again! "Clean rooms and good breakfast"
We stayed for 3 days here during our trip to Gatlinburg. The rooms were clean and the breakfast was good. The housekeeping staff was very attentive to our needs.My only concern was that all the furniture,curtains,chair was old and worn out. Got in late and got a room on the third floor. First thing we noticed was the hallway smelled smokey. Room wasn't much better. Remote didn't work on tv. Rug was ripped and towels were thin. Had a Luke warm shower at best. Staff was helpful on check in. "Great place to have a stay-cation!" Location easy to get to, near different amenities such as gas station and restaurants, was clean and breakfast was absolutely wonderful, especially the scrambled eggs. Will definitely stay here again. "In town for a wedding." Perfect location because of where venue was. Rooms were nice and staff were very friendly. It was nice place to stay and will definitely consider using it again when it is needed. Very quiet considering it is near some other hotels. I have stayed here for several years, but no longer. I will be looking for another hotel. The ac had an awful smell in room 222. The hot water would not transfer to the shower head. This hotel is showing its age. The best thing about this hotel is the lady in charge of the breakfast area. She provided outstanding service. "Hotel very good for our stay there." The hotel is very clean throughout with good breakfast and with comfortable beds. The staff was very friendly and knowledgeable and checkout was good. The location to freeway was convenient Our stay was relaxing and the staff was good about keeping the building quiet for other guests. "Nice rooms. Needs a Pest Control Company"
Overall had a great experience. Loved the jacuzzi in my room. Did not like killing 4 roaches during my two night stay. I left my clothes outside when I returned home until I was able to wash them so I would not bring the roaches into my home. We stayed one night here in July & 2 nights this month. Large room with king bed. Mattress was not that good & cover on mattress slipped all around & fitted sheet did not fit at all. TV was more like a monitor and was not set to the correct display & no way to reset it! WIFI was horrible and did not work. All we got was lame excuses from the desk personnel. They were not friendly or attentive and instead were more interested in their mobile devices than helping customers! Breakfast was just okay. Nothing remarkable about it except for the wonderful woman who oversaw the breakfast area. Friendly and kind, as were the housekeepers. As far as maintenance...probably need to clean hair balls out of sinks & tubs. Sloooow draining. Bad paint jobs in rooms & bathroom. Floor tile in bath could use a good steam cleaner! Towels were kind of thin and threadbare. For what BW is charging for the rooms, I expect more! Disappointed. Staff was pleasant and accommodating. Breakfast was good. Rarely have I found fresh (not instant) grits offered at BW's. Coffee was above average for BW's as well. Room was clean and normally appointed. My only complaint is that my room was the first off of the lobby and I was awakened at 5am by loud conversation outside the door. Also, the gap under the door was so great that I had to place a bath towel in front of it to block the light. Easy fix, but should I have to? Oh, good food can be found less than ten minutes away in town. I would recommend this facility if it is one of your choices for a night's lodging. 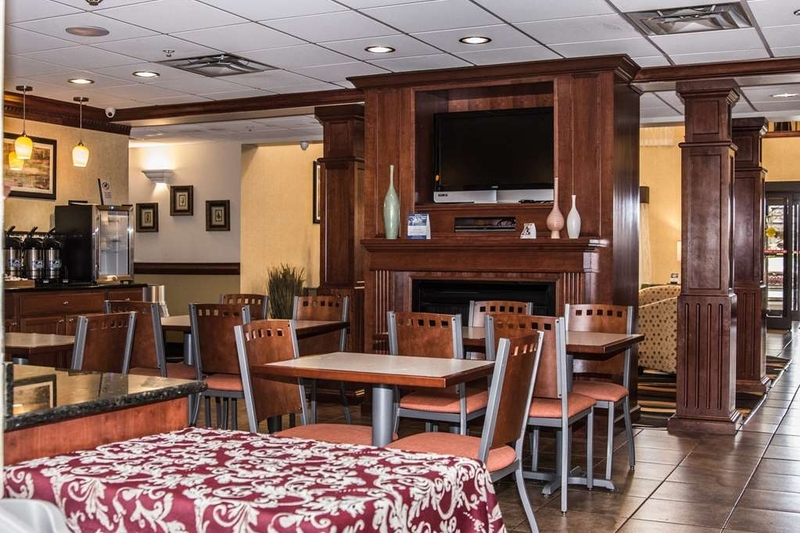 "We enjoyed our Best Western Experience on Strawberry Plains"
Everything was good. We were tired after tracing 11 hours from Baton Rouge. The checkin was painless and short and our room on the first floor. All the Best Westerns we stayed at had full breakfasts and that saved us money and time. We will stay again. "Overall a very good hotel"
I compliment this hotel on the breakfast and service there. Top notch! Room and bed were very comfortable. The only thing I noticed that I suggested the hotel address was wallpaper near the door was pulling loose from the wall and needed repair. Despite this, I would absolutely recommend the hotel and would stay there again. This hotel was clean and quiet, with a comfortable bed. That's the requirement for an overnight stay. But it had some added qualities. The television was large, with a good signal, Maybe not HD, but it filled the screen and looked good. The bathroom was large with a large vanity. Good water pressure in the shower. The only real negative I have to say is that it was next to impossible to adjust for warm water. It was either hot or cool. I won't say cold, but definitely cool. Plenty of face cloths and bath towels, not just a measly two. There was even a vent in the bathroom with a timer! The breakfast was a standout, according to my husband. I don't eat much breakfast. They had two kinds of sausages and what he calls "real" eggs. They also had biscuits and gravy and a microwave. Just in case something (like the coffee after adding cream) needs a little heating. I recommend this hotel! As part of the Harley Owners Group BW goes out of their way to take care of our overnight stays while on the road. They provide towels to dry seats, overhead cover parking if space is available. We like staying at BW when traveling. Lately though we have encountered sub-par breakfasts, not sure if this is the stat of a trend or what. This was the worst one we encountered but Burger King is across the street. The staff was very accommodating and friendly. The place was well maintained and clean. The room was clean and well appointed. The bed was very comfortable. The wifi worked everywhere but in the bathroom. The morning breakfast was good. I would stop again. The room was nice and clean. The free breakfast was one of the worst I've ever had. The coffee & cold cereal was good. We stayed here because it was late and we were passing through and it was close to where we ate dinner. Would stay somewhere else next time because of the breakfast. 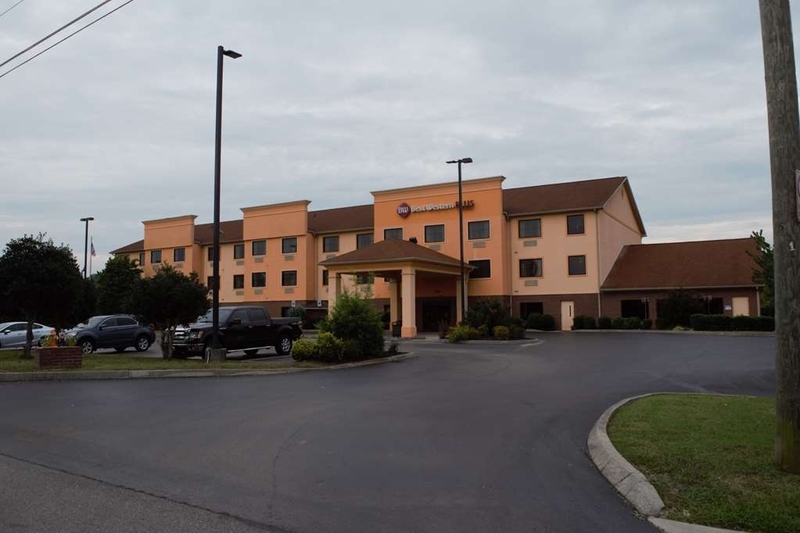 "Best Western Strawberry Plains, TN"
We always stop at Best Western Plus in Strawberry Plains, Tennessee, whenever we travel to the Knoxville, TN area because we know we will always have a nice clean room and a breakfast buffet to see us out the next morning. A very nice to take your family. If the pool was heating it'll be better. The staff is great. When youj walking in you can clean smell. I'd send anyone on a trip tol stay there. Your team has made it were we only stay at best western. Booked a room over a month out, was called a few days before and was asked to change my room type (double queens to a king, this was an inconvenient change for the people staying in the room) due to 'trouble with the room', they would give me an upgraded king bed room to compensate. I was not given an upgraded room. when asked if all the rooms were in working order, answer, yes. It was completely booked, so it appears that they asked me to change just to get another room booked, and then didn't compensate as promised. I did bring it to the front desk worker's attention, their response was that they didn't do it, it was someone else's doing. This is bad customer service and business. Best Western will be deleted from my hotel searches in the future. This hotel has been great for me and my daughter to stay in while traveling. I love how the rooms have a refridgerator, coffee pot, and free internet. The beds are so comfy! :) Additionally, the staff are very friendly and efficient. The facilities are clean and the lobby is beautifully decorated! This is a very clean and we'll kept motel. The beds are very comfortable along with a good breakfast. I stay several weeks on the road a week and this by far is one of the best motels at its price range I stay at. Our room was small and cramped and the bathroom seemed like it had been used for way too many years. The tub was stained and didn't drain well. The outside stairs were rusty and falling apart and the entire hotel looked very shabby and in need of renovation. It's a bit off the beaten path and there were some shady-looking people hanging out and smoking outside their rooms. The rooms are open to the outside - no indoor hallways and no elevator. Doesn't feel very safe. I had stayed at a competitor on my last trip thru TN and would not stay there again. I must say Im happy with everything. The room was clean, bed was great, tv worked. Overall this is my go to place again for a trip thru TN. "great place for a stop over"
everything was excellent. 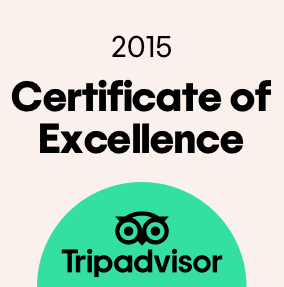 staff was great and helpful, room was clean and comfy and breakfast was great. the lady working the breakfast was very friendly and talkative. she kept up with keeping the food well stocked. I could have easily stayed at this place for more then one night. We enjoyed our night's stay. The room was clean and very quiet and would definitely recommend. The breakfast included an excellent array of fresh fruits that we particularly enjoyed. It was close to The Natural Bridge and other attractions. We spent 3 nights at this property. We ventured out each day to see the attractions. By the end of the 2nd day, we had a feeling of returning home. The hotel was easily accessible to attractions in the area (Pigeon Forge, Gatlinburg, Severville) and had a rate which was considerably lower than the outlying communities. I would recommend others to keep this in mind! A year ago on a beach vacation a Best Western reservation agent helped me sign up for Best Western Reward points. We quickly accumulated enough points were this was a free night. The hotel is very conveinent to the interstate. Several restaurants nearby. Staff super friendly. Room clean and comfortable Breakfast is what you expect. We will stay here again. This is a pleasant hotel on a dead end street near the freeway entrance but far enough from the freeway to make it a quiet and nice place to stay the night. The breakfast was first rate and the staff was caring and knowledgeable of the local area and attractions. I enjoyed my stay and the staff was very friendly and helpful. I am definitely willing to stay with Best Western again in the future. It is a hotel that is highly recommendable to my family and friends. I got an excellent deal online for a four-night stay here. Overall the hotel was fine. I reserved a smoke-free room and that is what we got. However, our room was one of two non-smoking rooms in the middle of the smoking rooms on the third floor. The hallway reeked of smoke and occasionally we would get a whiff of smoke in our room. And, we definitely came home with a slight smoke smell on our clothes. The breakfast was pretty good. However, our second morning there, something happened to the waffle iron and they did not replace it for the rest of our stay. We tried the pool one night and it was very cold. We could only stay in the pool for about 15 minutes before it became unbearable. It was also a strange greenish color. "Nice hotel, we would stay there again"
We got a good discount on the room. It was a nice, clean room. The staff was very friendly. The breakfast was good. The location was very convenient for us. There is a KFC, Burger King, and another restaurant right below the hotel. Cracker Barrel was just across the street. And a gas station was one road over. It was only 6 exits down from the Knoxville Zoo, as well. The only two minor negatives is that the elevator and hallway smelled like smoke (our room was fine), and the shower temperature was tricky to maintain. Overall it was an excellent hotel. We were pleased the Inn had honored our request for a quiet room with good access to the parking lot. There were no surprises, and the hotel represented a reasonable value compared to others in the area. Breakfast was adequate, some my find the breakfast attendant pleasant, other may find her a bit intrusive. Would stay there again if the price was right, but the property did not develop any real loyalty from us. Good location for highway access. "Our second visit will not be our last"
This will be a regular stop now on our way home to southeast South Carolina from Lake Michigan. It was our second stay and we were completely satisfied again. Our room was large and roomy, complete with microwave, refrigerator, coffeemaker, luggage rack, hair dryer & iron/board. Things we personally may not use ourselves but available to anyone who may. The bed was soooo soft and comfortable. The shower was great. Everything was clean. We used the hot tub later - and appreciated the extended pool hours (9 am-11 pm) and it was delightful. In the morning we ate their hot breakfast of scrambled eggs and brown & serve pork sausage links. They also have assorted breads for toasting, waffle maker, sausage gravy, orange & apple juices and plenty of hot coffee. The staff is friendly and attentive. Room prices are reasonable and the location is easy to get to. Definitely a great value. Third time staying at this property, very convenient to interstate. Clean & comfortable. Cracker Barrel right across the street Burger King next door. Gas station with 24 hr subwayAttractions close by. Everything was great until I was issued a smokers room. There was nothing else and I needed a place to stay. The front desk was very nice, the room was very nice except for the odor, the breakfast was good. It was conveniently located and close to every type of eatery. I'll stay there again only if I can have a non smokers room. My clothes are still remaking. This is a very nice, clean and quiet place to stay. Convient to Rt. 40 and Knoxville as well as Gatlinburg and the Smokey mountains. Only disadvantage is dinning is limited in the area, except for fast food type restaurants. Excellent location just off I-40 near really good eating. 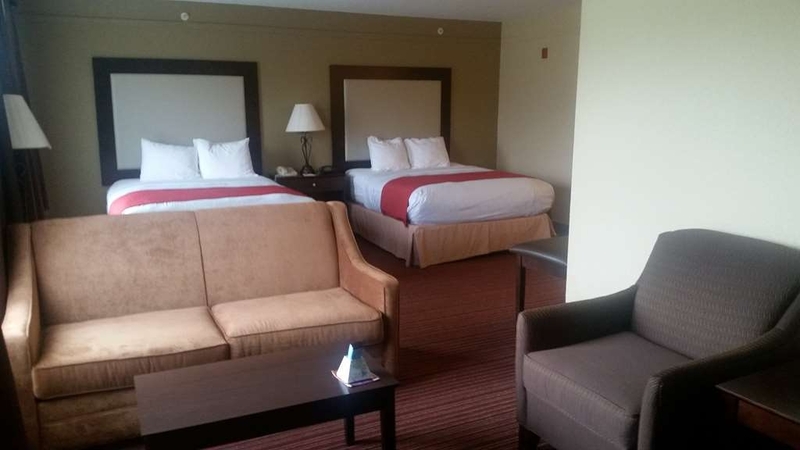 Rooms are very clean and quiet with beds that are comfortable. The staff was very efficient and made our stay one that would encourage us to return. We will start with the good things. The associates, in total, are wonderful. The lady that kept the breakfast, which was great, going gets an A+. The property is in the process of a refurbishment so our room was less than perfect, was acceptable. The breakfast lady would make up for anything. I still recommend this property let's just give them a chance to complete the refurbishment. It will truly be a "Plus". All was good, location, cleanliness, price, pool, hot tub, beds (comfy)and breakfast(breakfast had eggs, bacon, sausage and biscuits and gravy, also waffles !). Can't complain on any of the above. Also had a newspaper , microwave and fridge in room. All the comforts of home! Would recommend this place and would stay again ! We randomly selected this hotel while taking a road trip. The moment you walk in the door you are smacked in the face by cigarette smoke. We quickly dropped off our belongings in our room and headed out for dinner. When we returned we decided to ask for our money back because the smell of the smoke was making us nauseous. The manager wasn't understanding at all and wouldn't refund our money. Very Disappointed in this Hotel and the poor customer service. Booked with priceline on my way through late at night. The man at the front desk got me checked in immediately and gave me a great room. The room was clean and the shower was great. The hot breakfast in the morning was fabulous and since I only stayed for one night I can't comment on anything else about this hotel. The staff that I came across were all friendly. Was placed in a smoking room with no option to move. Was on spring break trip with family and arrived late into the evening and was given a smoking room even though non-smoking was booked. Hotel was full so no option to move. Room had a horrible odor. We stayed 5 nights while in the area. Was worth the price paid. TV didn't work first day, and was replaced by noon the next day. Breakfast was decent but not special. Pool maintenance done on Sunday afternoon, so had to wait. Our room was next to the equipment room, so was noisy. But the beds were wonderful! The room was clean and smelled fresh. The staff was helpful and a full breakfast was available with a delicious selection. We slept comfortably and were not awakened by noises outside or inside the hotel. The price was very reasonable. There was little to no hot water which was a huge disappointment. The furniture was extremely dusty and there was a lot of noise. Beds were comfy though, except it would have been nice to have a heavier comdorter. The TV and coffee pot worked well. Our room was clean upon arrival and every day during our stay, the staff was friendly, the breakfast was good (with good variety), the pool and workout room were clean and well kept. We will definitely stay here again. Hotel rooms were clean. There was no hot water and the front desk offered no resolution other than we can send maintenance later. That didn't help us. The temperature in the room read 80 but was really 65. Very disappointed with the response for the front desk. This hotel is probably one of the best "affordable" hotels we've stayed at in all our travels. Since moving from Michigan to South Carolina in February we've made the trip back up north twice. Stayed in a few hotels along the way, but I must say this one will probably become an ongoing stop. The staff was helpful and friendly. The common/breakfast area was clean and well attended. Breakfast was plentiful and nicely presented. The pool area was clean and we always appreciate a hot tub after a day long ride. The room we were in was clean and the bed very comfortable. We have been in the area before, actually stayed at La Quinta across the street, but this place is definitely the better choice. We forgot a pillow we had brought and the housekeeper saw it and called downstairs. The front desk staff ran out to the parking lot to tell us we had forgotten it. Also, the lady taking care of breakfast made a point to talk to most people to make sure they had what they needed. Very outstanding service. Out of all the hotels we stayed in on our vacation, this was by far the best. Good clean rooms. Clean hallways. No odd odors, or cramped bathrooms. The breakfast was outstanding as well. The lady taking care of the breakfast was very attentive and did a great job. She kept things cleaned up, and was there to lend a hand if needed. Good breakfast selection and good quality. The Best Western off of Strawberry plain is a great place to stay. We stay there each year while visiting the university and smokey mountains. It is a short drive to the university and convenient to I-40. The hotel is clean and friendly staff. We booked 2 rooms here for a weekend so that our daughter who's in college in Alabama could have a visit with her dog. The hotel was pet friendly and clean. Very nice staff and facilities. Would definitely stay here again. We have stayed here several times and overall is above average lodging. The rooms are clean and nicely appointed and the beds are comfortable. Clean and comfortable are a priority. As a property maintenance manager, I look at the little things. One quick check is the toilet seat and this one was terribly loose. Minor I know, but a pet peeve of mine. So, the room passes, the breakfast was typical and well maintained plus the staff are friendly. This is one I will continue returning to for an overnight stay. "Friendly staff and a great night's sleep!" Many thanks to Kimberley, Amy, and Elizabeth for their super- friendly service! 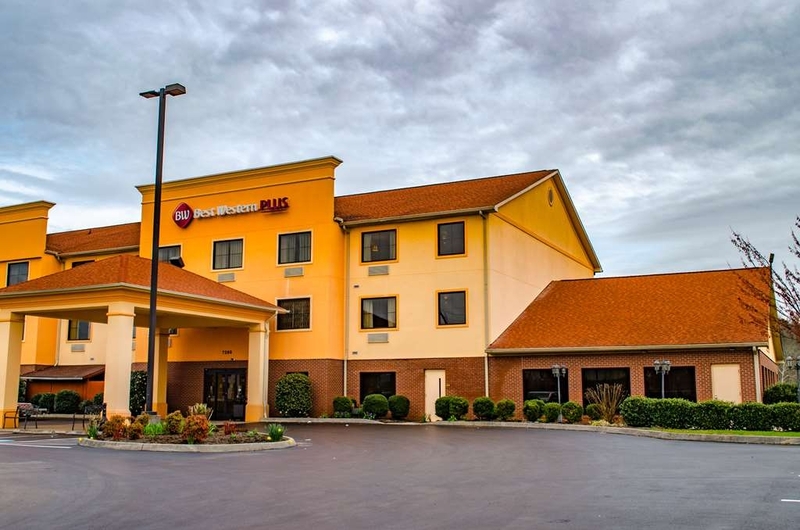 This Best Western Plus property is located right off I-40 in Strawberry Plains -- within walking distance of Puleo's Grille, an award-winning restaurant. Very accomodating. Very clean. Handicapped accessible. Good breakfast. Great, friendly and helpful breakfast attendant. After a long trip, it was a great stay. Can't say much for the traffic in the city, but I am nervous on freeways. We stayed at this hotel during a football weekend. The hotel was extremely clean and very comfortable, there was plenty of parking, and it was an easy drive to the Tennessee football stadium. The staff was quite pleasant and helpful as well. We would definitely stay here again! The location is very close to several places to attend, close to the University of Tennessee, Sevierville, Pigeon Forge, Gatlinburg. The facility is very clean & well taken care of. The pool & spa are very clean, as well as the interior & the rooms. Best deal for gameday. Close to Knoxville, many restaurants to choose from. Super polite staff and good breakfast. 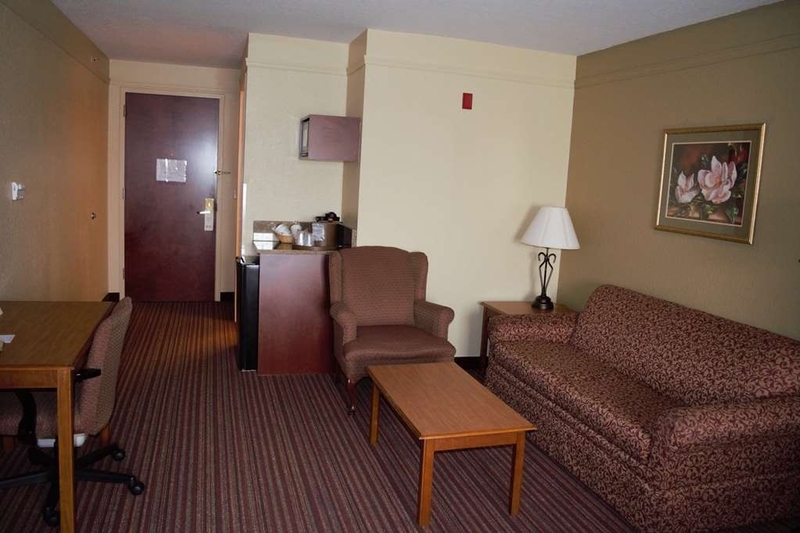 Suite rooms are large and comfortable, plenty of room for visiting with friends and family. 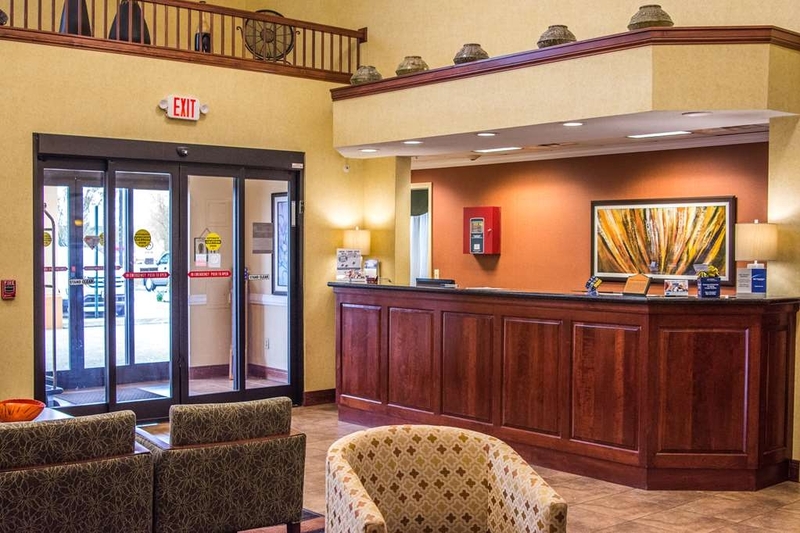 Want to stay where it is convenient to Knoxville without the traffic? This is the place. We always stay at the "Best western" strawberry plains each time we travel to Knoxville. It is close to all the attractions and the great smokey mountains. The staff is extremely friendly and show off the southern hospitality! "Good place for a tired traveler"
It was time to quit for the night and get some rest. Because of the rewards points, I was looking for a BW and found this just as I was about to give out. Far enough from the interstate to be quite and I found it to provide a good nights rest. The room was clean and well kept. We had to deal with a disgruntled employee at check in, but otherwise had a great experience. The hot tub would have been nicer if the jets had just a little bit more pressure. Breakfast in the morning was very good with lots of variety. My wife and I had been in a campground for a week in a pop up tent trailer. We were looking forward to a nice bed with air conditioning and no humidity..... We were well pleased with our stay here. Very nice facility and everyone was pleasant and seemed to care about the job they were doing. Breakfast was good and the lady that was taking care of it was very pleasant. "Good Hotel and a Very Nice Breakfast"
Quick overnight while on the road. 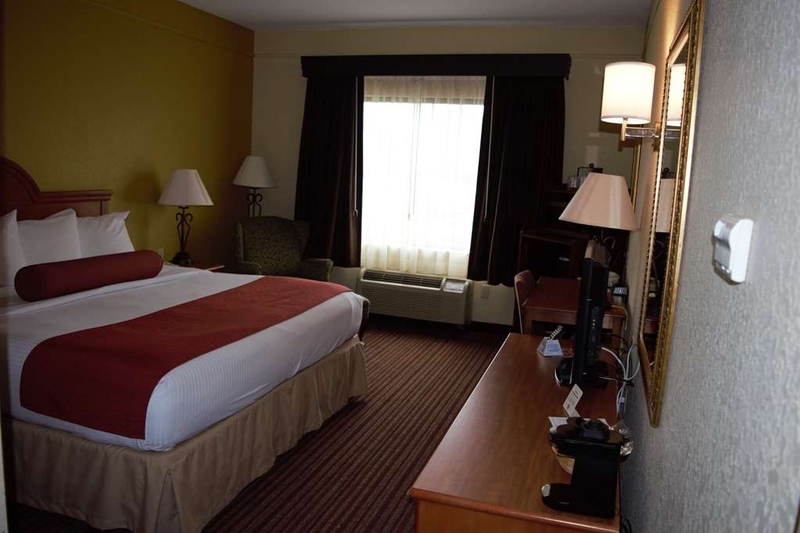 The location was easily found, the room was clean and spacious, and the staff was accommodating. We were delighted with the variety offered at breakfast and with the very comfortable dining room. I'd certainly stay again when on the road. "Good Hotel; Especially for the Price"
Good hotel at a great price. Tremendous service. Staff was very attentive. Comfortable room, lots of space and a nice bed. Excellent breakfast. Clean, relaxing place to stay. Two challenges: Room smelled like Febreeze. Light switch didn't work. Overall, good place. We will definitely stay there again. I have actually stayed at this hotel twice for business (the last time was 4 years ago). It has the basics and a friendly staff which is all I really ask for in a hotel. The room was clean and I didn't have any issues to report. I did not try out the fitness center or the pool/hot tub. It is a good location; I don't think I ever drove more than 15 minutes to/from where I needed to be. Their location is pretty nice with lots of places within minutes. They serve a nice breakfast and the hotel is very clean. I had 3 complaints: 1. As soon as I opened the door a horrible smoking odor welcomed me to the room. 2. The bed had an issue where the 2 of us would meet at the middle of the bed. 3 This one is not important, but since I come from a place where the coffee is one of the best in the world, everytime I drink coffee in the mainland I compare it to the coffee in Puerto Rico, this one has almost no flavor. I was in town for four night getting my daughter settled into UTK. The hotel and the staff were exceptional. The amenities, rooms and staff were on par with the Hilton Garden Inn located on campus where we stayed during Spring break. The Wi-Fi worked flawlessly which allowed me to work remotely for two full days. There were no interruptions of service. The free breakfast was very good. It included scrambled eggs, sausage, bacon, waffles, biscuits, fresh fruit, yogurt and even cashew milk. I was amazed by what I got for the price of the room. It is definitely my hotel of choice for future trips to Knoxville. Despite a very friendly staff and excellent breakfast, I was unhappy with my stay. I've since been told that remodeling is taking place, but I found the room to be dated. Upon entering the room, the deodorizing smell was ultra strong, almost as if to mask something. The blanket was very old and thin. The flat screen tv stopped working for 15 minutes, and came back on with a faded picture. On the plus side, the room was spotlessly clean. The fitness center consists of 4 cardio machines...rowing. treadmill and elliptical. Because of my late arrival. and desire to get some sleep before hitting the road again, I did not report my concerns until getting a Best Western survey. Upon doing so, the manager was quick to provide a cordial response. Motel was clean and convenient to the interstate. Room was clean and counter in bathroom large. Staff friendly was friendly especially the breakfast staff. Breakfast had hot and cold choices from scramble eggs to cold cereal. "Dated BW Plus hotel - doesn't meet BW Plus standards?" At check in and check out there wasn't anyone at the front desk. We had to wait several minutes both time until the front desk staff were available. It's not like we showed up at weird times either, 9:30 PM for check in and 7:00 AM for check out. The lobby decor is dated. The room furniture is not comfortable. The room and bathroom decor is dated.The lobby area had a strong odor of cigarette smoke. Fortunately, our room did not smell. The price was the clincher when I made the reservation, but the hotel was more in line with the standard BW, not what I expect for a BW Plus. Spent one night here with friends while on a mini road trip. Nice property but is dated. Service was ok but the lady over the breakfast area in the morning was super. She loved her job and it showed. Room was quiet and comfortable. Would stay here again. Everything good except hot tub not working and phone in pool area did not work. They need a person on call to fix things. Breakfast was good. Location was good. Too much bleach in pool area. Staff friendly, no manager there on duty ever. "Ok for a quick stop"
Stayed for one night recently, but wouldn't likely choose this motel again. It was clean, close to the highway, and had an indoor pool, but I was mostly turned off by the not-so-friendly staff at check-in. There was no one at the desk when we arrived- only a note saying 'be back soon'. Not really what you want to see after a long ride in the car when you just want to get to your room and chill. Rather than wait, we went to a nearby restaurant for dinner and then returned to check in - only to be greeted by a unwelcoming desk attendant. I have to say that the person in charge of the free morning breakfast made up for this in spades with her genuine friendliness and helpfulness. Overall, it was about what you would expect for $85/night - not terrible, but nothing that blew me away. 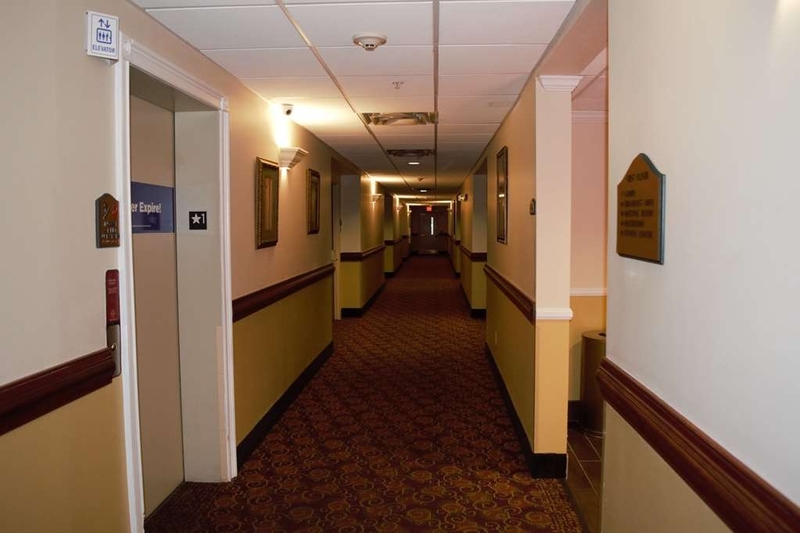 This was our first stay at the Best Western Plus Strawberry Inn & Suites in Knoxville, TN and we enjoyed it very much. My husband and I were there to visit the Great Smoky Mountains National Park and this was a great place to stay. If we come back again to this area we would definitely want to stay at this hotel. 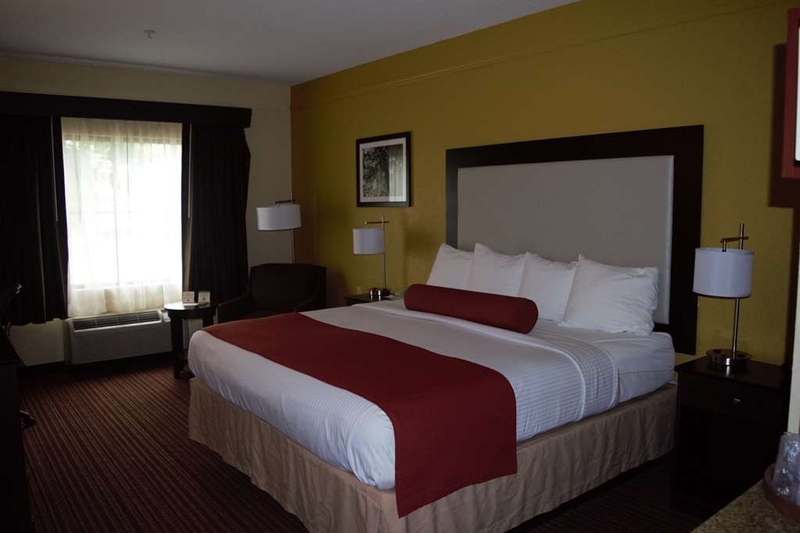 The room was very nice, clean and comfortable, breakfast was good and the staff was very friendly and helpful. My family stayed at this hotel in late June for a family reunion. 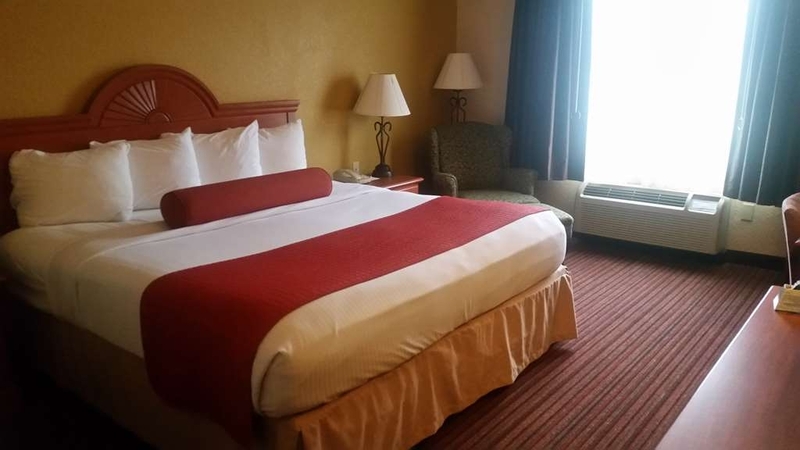 It is conveniently located near the freeway, gas stations, a few fast food restaurants, and a couple other similar chain hotels. 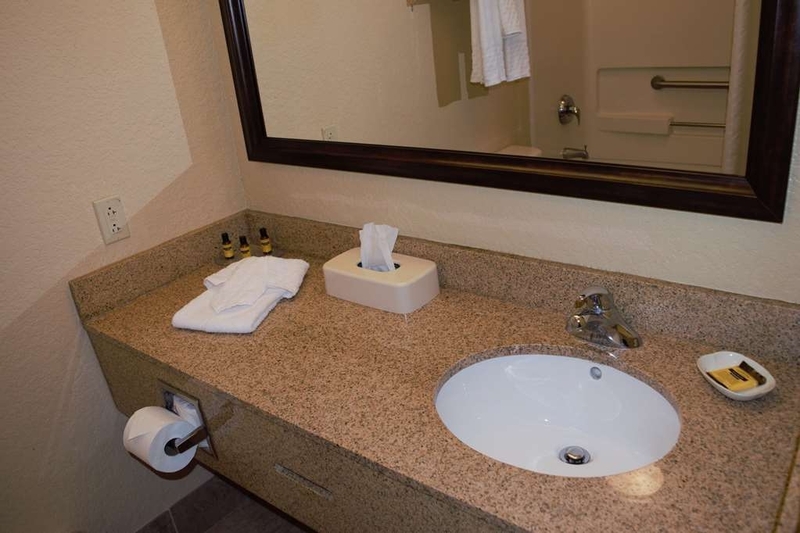 The rooms are spacious and clean, with very basic bath amenities. The beds are comfortable; however, my mom who is 5' 1" and with some mobility issues had a tough time getting in and out of the bed due to its high elevation. The room had a small refrigerator, microwave and a coffee maker. The free breakfast was better than expected, with plenty of options for most to start your day: eggs, sausage, oatmeal, cereal, biscuits and gravy, make-your-own waffles, bananas and apples (in good condition), coffee and tea. The lady tending the breakfast area was absolutely amazing and I love her sweet southern charm. Lastly, I had no issues whatsoever with the staff as other reviewers have noted. 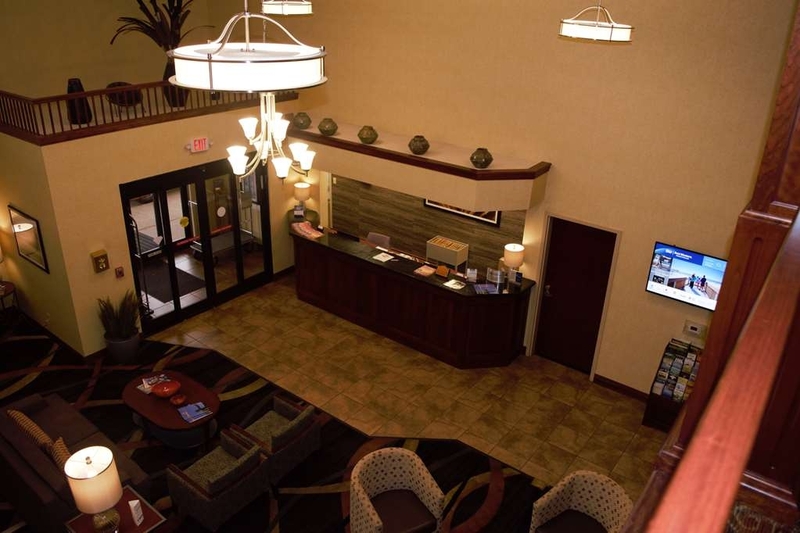 I worked primarily with Eric at the front desk; he was very helpful, responsive and accommodating. Every staff member I encountered in the hallway was very polite and helpful at all times. The housekeeper even thanked me for the tip, which is rare and a nice touch. All in all, I really enjoyed the stay. Is it perfect? No, but it's a great hotel for its category and I would consider Best Western again based on this visit. "Best Western Strawberry Inn and Suites-"
This Best Western was much better than most I have stayed in. Overall it was clean but the mattress was no good. The lady working the breakfast area was awesome....very friendly and attentive. A good place to stay if you want to go to the Smokies and not break the bank to pay for lodging. We needed a place to rest on our 15 hour trip to the beach. This Best Western was awesome. The beds were comfy, the rooms were clean, breakfast was like home and the courtesy of all the staff was the expected southern hospitality at it's finest. Would highly recommend this hotel to anyone! "Trek Through the Southern States, Night # 2"
Honestly, my expectations of any Best Western property is never very high. I tend to have a lower bar so this review might be effected by my inherent bias. Having said that, I was very impressed. My room was gorgeous and decently clean. Staff was decent, nothing special but I could work with it. Location was excellent, many things within a 5 mile radius. I paid $110.00 approximately, which I felt was very fair. Fitness center was bare minimum, so if that's your thing I do not recommend that. I recommend to anyone who is familiar with Best Western properties. Stench of cigarettes was all pervasive even though the room was non smoking. Staff refused to show any flexibility blaming Expedia for their own stubborn attitude. Checked in by a desk clerk who had a plate of food on the desktop in clear public view. I was grateful that she eventually put down her hand held computer game, to complete my check in. "BYO coffee and reading light"
My wife and I stayed here for one night, en route to D.C. Its convenient to the exit, and there is a very good restaurant (Puleo's) 100 yards away (also KFC, for the chickaphiles). Our room had 2 queen beds. Tha mattress was cratered in the middle but otherwise reasonably comfortable. Each bed had 4 pillows (all the same however, no choice of hard or soft). The A/C is a standard thru the wall unit--the type without adjustable vents but at least it didn't blow straight across the nearest bed. Unfortunately despite the thermostat there's no option to turn the fan down to low or up to high. About the coffee: the desk clerk at 7:30 pm confirmed to me that the hotel provides hot coffee 24 hrs. Sorry, not here tonight. The airpots were empty and the kitchen locked up and of course, the clerk had no key. However they do sell snacks and ice cream bars at lower than average prices. Me, I had a dessert cake from lunch that I washed down with the in-room coffee. Don't look for dark roast, though. About the lighting; standard, one 2-bulb table lamp to share between the beds. Great if one person wants to read at night, not so good for anyone attempting to sleep in the other bed. (True, but that assumes one can get the lamp switch to work. I managed, finally.) Wall lamps also standard, independently switched. No desk lamp for the small corner table. Again, leaving either wall lamp illuminates the entire room; sorry, sleepers. The in-room wi-fi speed test showed 6.8 Mbps down, 6.99 up but is not protected. 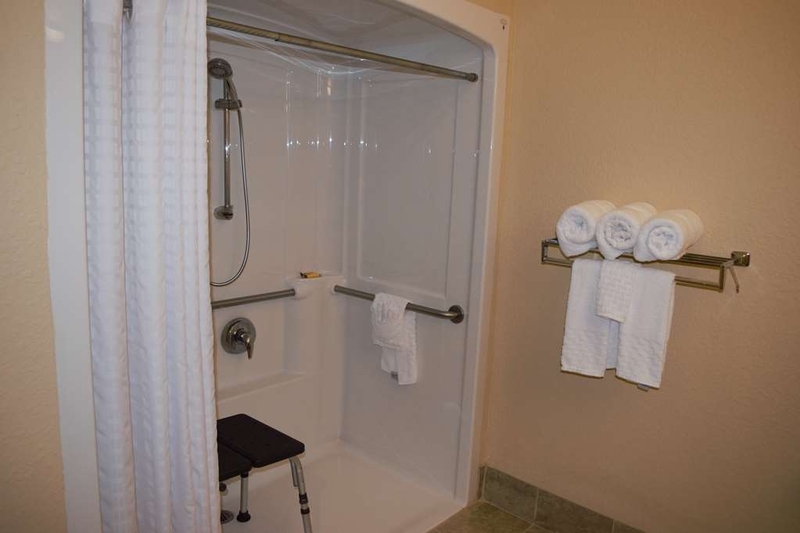 Bathroom: the water pressure is good and the shower head adjustable. The toilet seat was loose. A hair dryer is provided. The self-serve breakfast was the usual scrambled (powdered?) eggs, sausage & gravy, waffles.Fruit was limited to apples and green bananas. The breakfast room attendant was cheerful and friendly. They have an exercise room and indoor pool, but we did not try either. We should have made reservations directly with the hotel, as their price was considerably less than the online service, and once the reservations were made we were committed to the higher rate. So, if you think you can get a better price online you may be mistaken. Also, I assumed we would get a non-smoking room - should have read the print on my iPhone more thoroughly. When we entered the room it reeked of cigarette smoke. We were able to change from a smoking to non-smoking room, but it cost us an extra $25, and we hadn't used the room or bathroom. We visited Knoxville for a family reunion, so we were away most of the time. We didn't expect to spend a lot of time in our room, so we opted for a budget friendly hotel. The Best western Plus, Strawberry Plains was a good base for running in and out and sleeping. The staff was friendly, they provided breakfast, the room was clean, and it was close to a couple of restaurants, gas station, grocery store and I-40. That said, the room smelled of smoke (stayed on our clothing), the indoor 'spa' was kind of small and highly chlorinated. If you are looking to save money or staying just a night or two, I'd recommend it. From the start, this hotel exceeded our expectations. Food was good, room was spotless, and the check in and out was flawless. Will stay here again. This hotel is conveniently located off the interstate. Stayed 2 nights room was clean. Bed was comfortable Breakfast was ok nothing special I would give it a 6. But it was free the dining room was kind of small so it got crowded fast. The parking lot was small I don't think it had enough spaces for the amount of rooms. But not sure. Plenty of restaurants close. And it's close to Gatlinburg maybe 15min drive. Overall I would give everything a 7. All frowns and no smiles by this staff. Rude front desk employee. She never looked at me or said hello. All she asked was "last name?" while eating her potato chips. Very rude to other people that called while I was trying to get checked in. 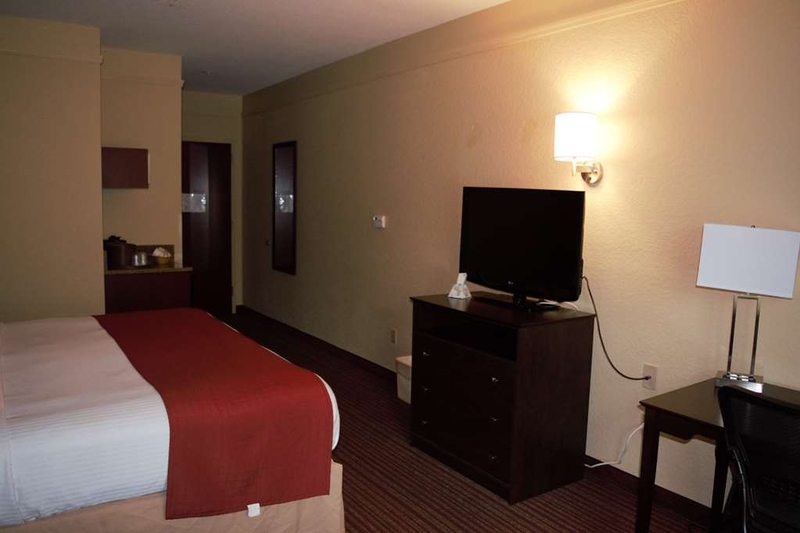 Hotel conveniently located next to fuel and a short walk across the parking lot to a good restaurant and bar. These factors as well as location make it an excellent chose for Harley riders even though it is not as motorcycle friendly as other Best Westerns. I'm not sure if this is true for all rooms but ours was heavily fragranced. It was noticeable when we checked in but we thought it would dissipate with air flow. However, when we woke up in the morning our eyes were irritated and we were congested. It's too bad because otherwise our room was large, clean, comfortable, and quiet. For us and for many people, heavy scent can be as problematic as a smoking room. "Clean rooms and great breakfast to start your day!" I have stayed here on a couple of occasions. Good service clean rooms. My fav part is the breakfast. It is perfect to stick with you for the day. Great location for local horseshow. Oh and ask about the hotels discount card to puleos grill that is within walking distance. "Best Western Plus (minus) Strawbery Inn & Suites"
Called early to make our reservation for King non-smoking. Didn't have any, so settled for 2 Q's. After looking at our room, we refused it, as the beds were sagging, not very clean and scribbles on the wall. We were given the option of an increase of $10 to upgrade to a King non-smoking. We took this, but the room was on a smoking floor and of course the smell of smoke was in the room. The desk lamp did not work, the outlet in the walls was iffy at best and the toilet seat slid all around. They did waive the $10 increase, but not a Plus Best Western by any standard. Went to do laundry, but was too dirty to even think about doing it here. Not clean in appearandce at all. I don't understand why hotels advertise non-smoking rooms when their rooms reek of stale smoke. 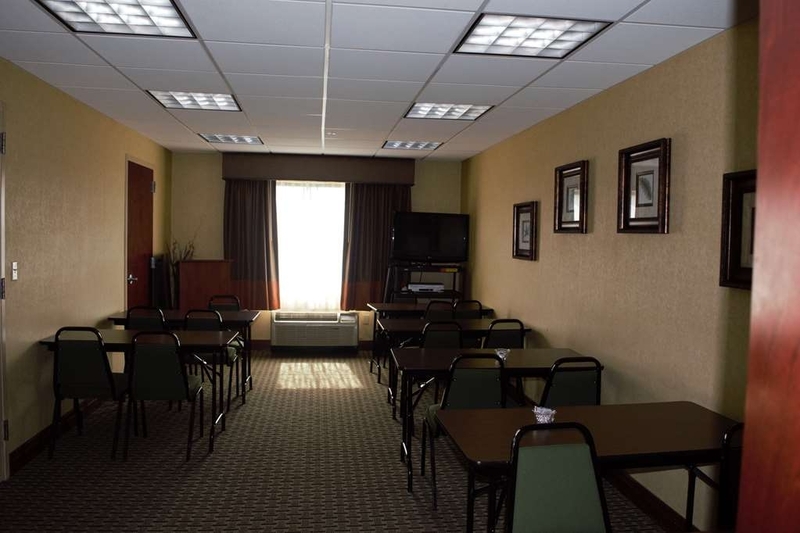 Convenient access off I-40 for travelers, average accommodations, and usual free breakfast fare. I would probably give four stars but the smell just ruins it. Conveniently located in east Knoxville. Easy to get to off of I40 on eastbound side. Many places to eat within walking distance. Indoor pool. Reasonably priced. Not sure if I would say that this qualifies as a BW Plus, it may have been the on-site gift shop, I know it wasn't the bench by the entrance where the staff sat and smoked cigarettes! We stayed overnight while travelling through to South Carolina. The staff was very friendly and professional and the property was very clean and well maintained. The breakfast selection was your basic continental fare. The fruit was limited that day for some reason. Access to the interstate and a good selection of restaurants nearby was a plus. Our room was very nice, as was the bed, bathroom, wi-fi, and TV selection. The rooms are ok, but I was disappointed to walk into a wall of musty, smoky air when I opened the door to my room. Management insisted that no one had smoked there (obviously false) and put two dryer sheets in the air-conditioner, which helped cover up the smell enough for us to at least get some sleep. I'd recommend paying $20 more and staying at one of the many better options nearby. This hotel and the staff were awesome but I have to rate it lower because I can't believe they would put beds on a wall that has an ice machine and vending on the other side of it. The room was clean except for the shower head in the bath. We had plenty of towels and a great TV with a refrigerator. The hotel is located near restaurants and shopping which is very convenient. We went out to eat and after we returned we started hearing thumping behind the beds. One slam scared us to death. I realized it was the vending area but it was too late for us to be moved as we were ready for bed. Luckily it did die down once people started to go to bed. Lesson learned - find out if there is vending behind the room when you check in. I have never experienced this any where else. I chalk it up to poor planning and thin walls. "Pool/ hot tub ruined it! " 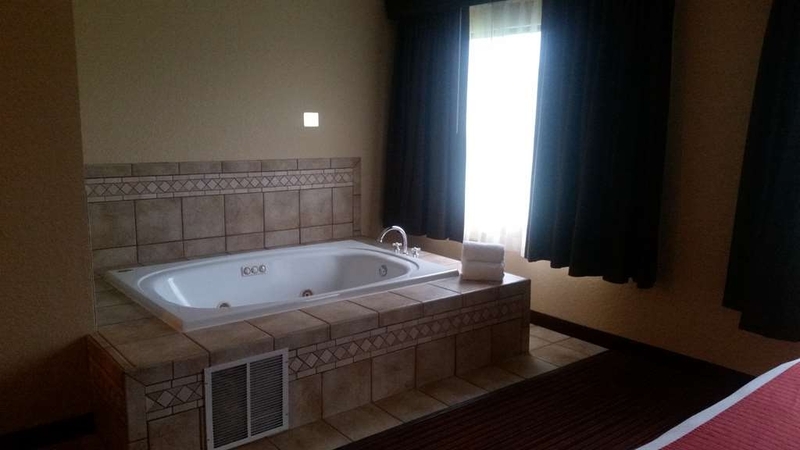 I purposely booked a hotel with indoor pool and hot tub. How disappointing the indoor pool was freezing and hot tub was pool temp should have been! Room was nice, staff was nice but the whole pool situation ruined it for our quick family get away! 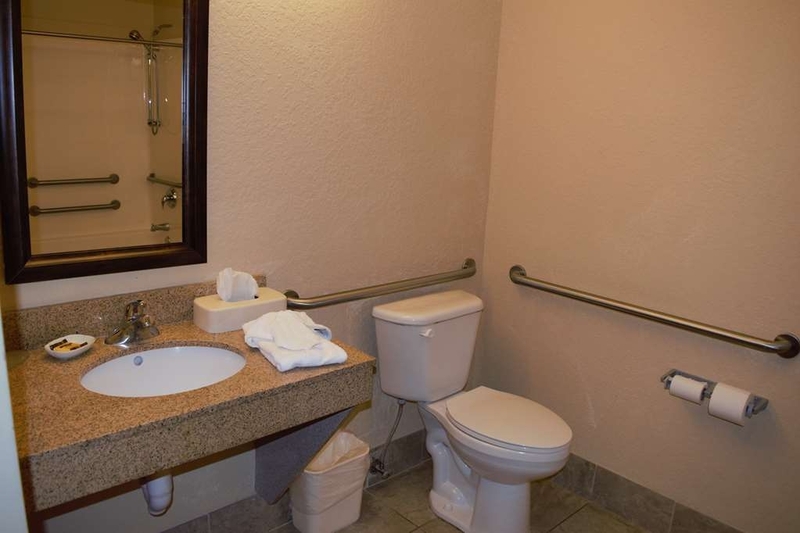 We chose this place because of the good reviews we saw and the amenities listed on the website. Everything was just as listed and the breakfast was better than most. The best thing was that it is surrounded by restaurants, some fast food and one good quality place. All in walking distance. 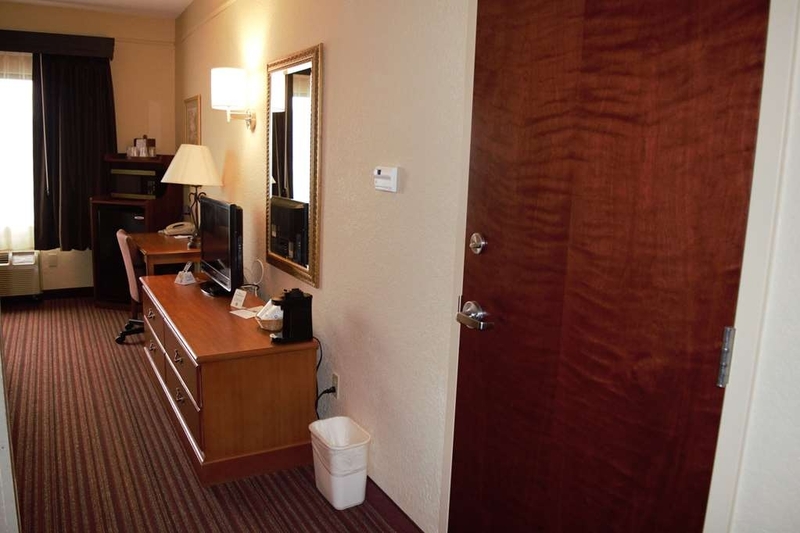 The hotel location is not far away from downtown Knoxville or from Pigeon Forge. Our check-in and check-out experiences were quick and easy. The continental breakfast was provided early, and there were a lot of options. 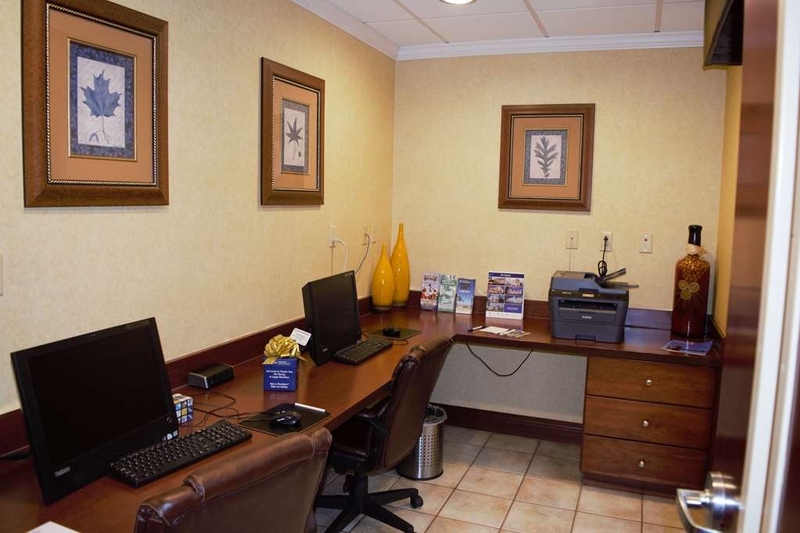 "Good value - nice location"
This Best Western is well situated with several good quality and fast food options close by. 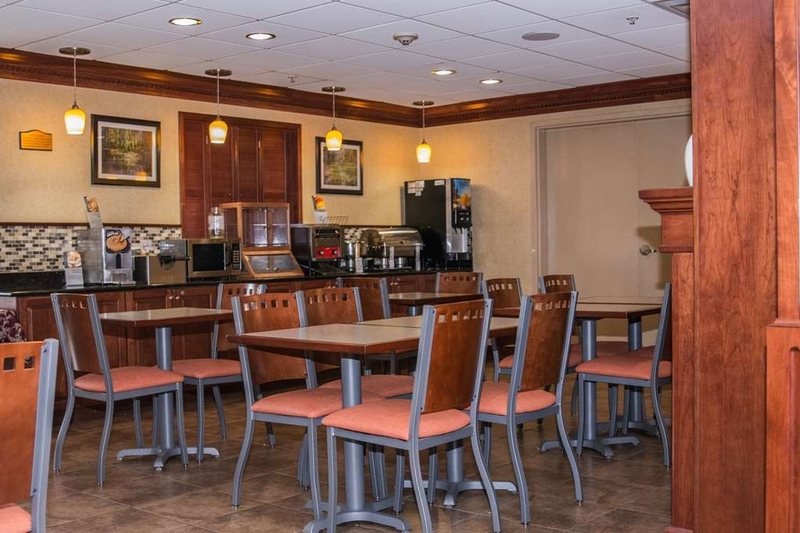 The breakfast area and options available are slightly better than your average Best western as well. We did not use the outdoor pool or hot-tub but it looked as though those who were using it were enjoying themselves. Clean room, good service from all staff members. It was nice that there are a number of different restaurants within walking distance of the motel. Breakfast was good with a few hot items, besides the usual cold cereal and fruit. After checking in (with no warning of what was to follow) we walking into a room that smelled like an ash tray. Then we saw an ash tray and realized it was a smoking room. Called front desk and they said that's all we have left (no apology). We were later woken up by loud talking and music in the room next door. I called the front desk and the gentleman said "I'll let them know" ..strange response and the noise did not cease... Really? At checkout he next morning I asked about the noise and getting no real assistance and she said, "oh those people are here long term and we'll have to talk to them." That didn't help us sleep. She was the first person who was very nice but said she couldn't do any compensation because we booked though a 3rd party. Worst experience ever. If you look at my reviews you will see they are nearly all 4 stars or higher- I am pretty easy to please. We like this Inn with a friendly staff that recognizes us as past visitors. I like the strawberry theme in the lobby and in the breakfast area. 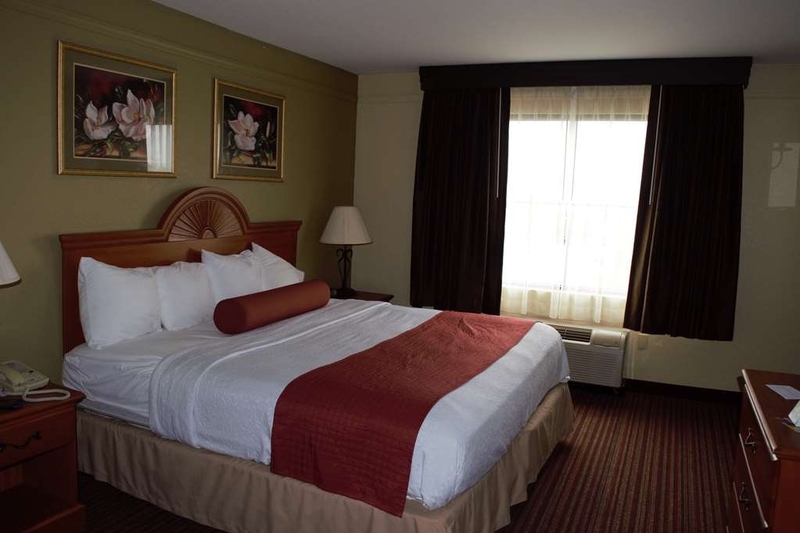 The Inn is clean, comfortable and conveniently located right off I-40. The breakfast is complete and the area is kept clean and neat. The beds are comfortable, too. This hotel has a problem with maintenance. Hot water was out at 8:15 am and the shower drain was clogged on the 3rd floor. I would skip it. The room was non smoking but still had a lingering smell of smoking. Also, the bed was generous in the suite but was saggy. Hotel and room were clean, staff was friendly and helpful, and it was very quiet. Pool was clean and pool area was well taken care of. Workout room was also clean. Breakfast was good too. I have no negative things to say; we would definitely stay here again! Our bathroom toilet was not bolted properly to the floor. The toilet tipped from side to side. No hot water from the sink had to use the bathtub water for washing. The jacuzzi in the pool room only had 2 jets working. The queen bed was flat and lumpy. Last years stay was nice. The quality has diminished. "Friendly staff and very clean"
The staff was very friendly and professional and the property has been updated throughout. Very clean and well maintained. I cannot address the rates as I was there on BW rewards points.The breakfast was substantial and they have one of the best channel selections I have ever seen in a motel. Very easy access on an off the interstate and a good selection of restaurants within walking distance. There were two small issues, the parking lot is pretty small and since I pull a trailer it was good that I arrived fairly early and second the mattress was beyond firm, more like downright hard. But since it was only a one night layover it surficed. "Best place to stay in Knoxville"
I never stay anywhere else when I have business or pleasure in the Knoxville area. 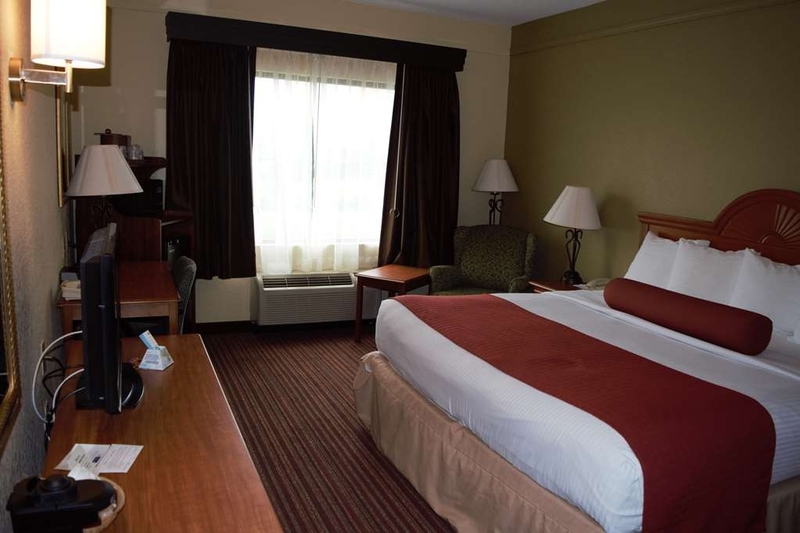 This Best Western is a very good value and the staff are always friendly and accommodating. The place is clean and nice and the free breakfast is always a plus. The weather was Predicted to be icy so, I came into town a day early to prepare for an interview. Upon arrival I was greeted with a chocolate sampler because it was Valentine's Day. The hotel staff was friendly, the room was clean and comfortable. 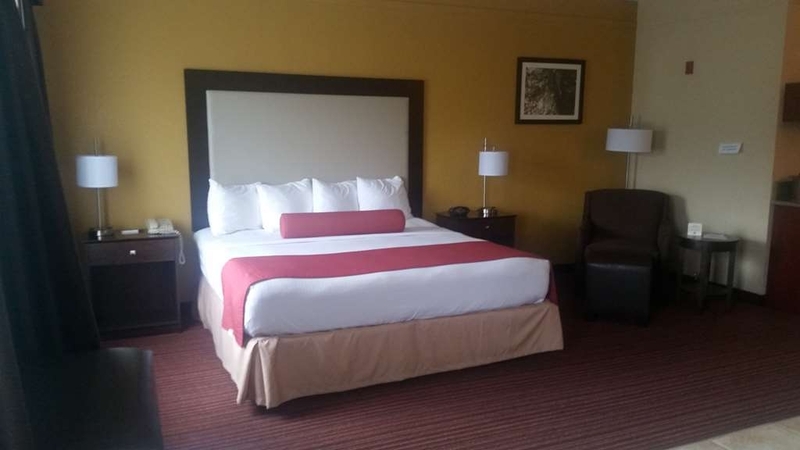 I have found this particular hotel chain to be superior in their price range the beds have always been comfortable no matter which best Western plus I have stayed in. They are my first choice in the budget hotel price range. I will always look for the best western plus when traveling from now on. Everything was very clean, and quiet, easy to sleep, everyone was nice but the pool had so much chlorine, you could smell it, and it made your eyes pure red. But the only bad thing was the pool, and the lobby temp. it was freezing. Would Recomend it. The rooms were nice with comfortable beds. The breakfast was more than adequate. Among other things it included bacon, sausage, gravy and biscuit and bagels and cream cheese. Internet worked well. Staff was friendly. "best palce to stay in knoxville"
"AMY S. IS Very professional and Courteous." Really enjoy the staff, they are very Friendly and helpful And are more then willing to accommodate your needs. And they do so to the best of their ability, When Amy S works she's always smiling and ready, Denial is very helpful as well overall always a great experience. I stayed as an overnight stop traveling north. It was clean and quiet. Bed was ok. They had a decent breakfast. Front desk personnel were nice. I would stay here again. It is right off the interstate. great hotel there for business staff engaged when asked a question they were very nice breakfast was average good but I'm a chef so I have different standards staff was helpful and rom was clean and good size had stayed at a Hampton inn the night before and this room was bigger a little outdated in the lobby but that was not the way the room was bed was comfortable and room was clean had a fridge and a microwave (older but it worked) there are a few fast food restaurants and a few nice restaurants right by the hotel when I return to Knoxville in the near future I will be staying here. "Good Place for a Stopover in Knoxville Area"
Stayed here for one night on a cross country solo driving trip. Room was comfortable, clean and quiet. I enjoyed using the treadmill in the small fitness room after a long day of driving. Breakfast was fine. The young man at the front desk recommended the Italian restaurant nearby and I walked there for dinner and had an excellent lasagna. Overall a very comfortable stay. I would definitely stay there again. A good value for the money. "Very Nice Hotel And Friendly Staff"
I don't travel often but this hotel was a nice place to stop on my way to the beach. Front desk clerk Amy was friendly and made small talk with me at check in. The room was clean and the bed was comfortable. Breakfast was very tasty and the lady who worked the Breakfast Elizabeth was very sweet and I loved her southern accent. Check out was speedy and also pleasant. All in all this was a plesant trip and I will recomend it to friends and family. Accidentally booked the wrong night and the hotel worked with me to make it right. It wasn't easy but they made it right and made me very happy and would stay again. Don't book and navigate at the same time. 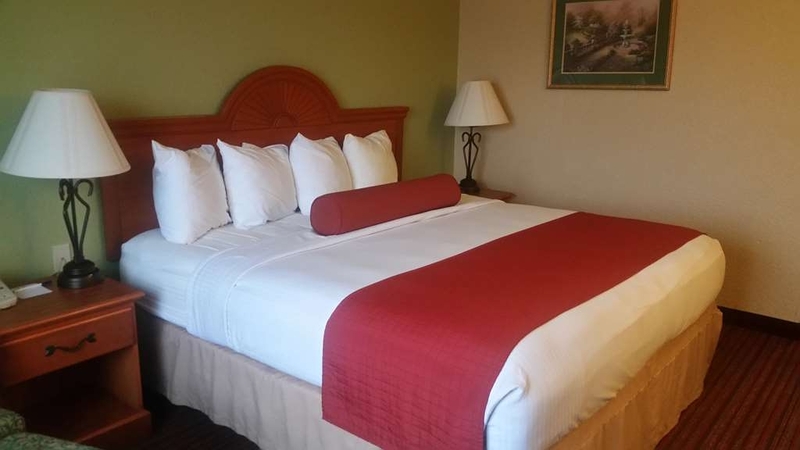 Amy was very helpful in making it the right reservation, the room is clean and beds comfortable. I always stay with best western and this is just another reason why I do. "Surprisingly bad despite good reviews"
The good: The bed was comfy and the room was relatively clean. There was running water. The breakfast was hot. The lobby is very nice looking. Check in and check out was smooth. The bad: Quick version- we had no heat on a below freezing night and the hotel didn't do anything about it, the third floor reeked of smoking smell and chemicals, and the pool was a wreck. Long version- This was actually the worst hotel experience I can ever remember. We arrived at 3. All was well until we reached the third floor. Our first impression was cigarette smoke, which was ironic due to all the non-smoking signs. I was getting nervous, but I really wanted this to be a great weekend, so I figured the room wouldn't be bad. The wall paper in the hallway was bubbling and peeling off the walls, but again, the room is what matters. We opened the door and were greeted by not cigarette smoke- thank goodness! But the air was cold and there was this strong chemical smell (probably to remove the previous smoking smell). We turned on the heat that was obviously not on and unpacked, heading off to the wedding that had brought us to Knoxville. We arrived back at the hotel around 10:30. The parking lot was full, so obviously they had a lot of business that night. We arrived at our room again after holding our breath through the hallway (yes, it was that bad) to find the room was frigid. It was unfortunate since it was near freezing that night. We also began to notice how strong that chemical smell was again. My husband said he could taste it. We fiddled with the heat, and realized that it was blowing out COLD air. I suggested going downstairs and asking for help, but Husband thought he fixed it/didn't want to move our stuff, so we climbed in bed. It was not fixed. After laying in bed for an hour, we were both shivering. We could hear people in the hall, outside, etc. My stomach was starting to feel nauseous from the chemical smell. I finally convinced Husband to request a room change. Downstairs, he is informed that there are no vacancies (I believe that b/c of the parking lot) and that there is nothing the hotel can do. He asks for a discount, but we "already received a discounted rate by booking through a third party." He asks if anyone can take a look at the unit, you know, since it is below freezing outside. The concierge calls out her 12 year old son to have him check the thermostat (not the unit). My husband declines this offer as the thermostat has two switches (cold and heat, auto and fan) and he can figure out that as well as a 12 year old. He comes back. We take the blankets off the other bed, huddle together for warmth and get over it since sleeping in our car in below freezing weather is a bad idea. That morning, we are still cold. We go down to an okay hot breakfast (salty eggs, but good everything else). It is warm in the rest of the hotel thank goodness. I REALLY wanted to swim in their pool and have some hot tub time before we check out. Those amenities attracted me to the hotel in the first place. Plus our room is cold. We get to the pool and its bottom is filthy. There are chunks of loose concrete littering the bottom and all sorts of things floating in the water. As an ex-hotel lifeguard, I was appalled. It MIGHT get cleaned once a week, every two weeks, when a hotel pool needs a minimal every other day cleaning. Needless to say, I skipped it and the hot-tub (hot tubs are typically unsanitary in the best hotels). We checked out earlier than planned. The morning concierge asked about the heat and offered an apology, but nothing else. Our luggage smelled so strongly of that chemical that now our car still smells of it, 24 hours later, not to mention our clothes and suitcases. Best Western, I would strongly look into the management of this hotel. "Have stayed here many times over the past 5 years"
Generally, the hotel is very good. Always clean and orderly. 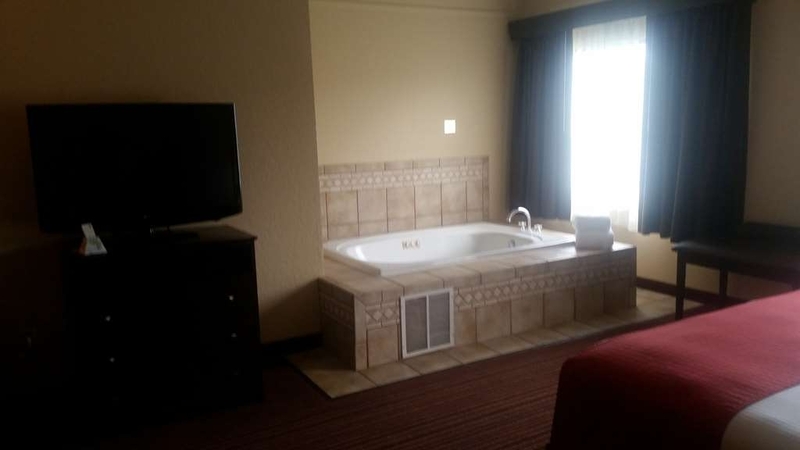 Amenities are about standard (internet and free breakfast), and the pool and Jacuzzi are indoors, and very nice. With the exception of a very unhelpful front desk attendant 3 years ago, the staff has always been both friendly and helpful. The location (right off the highway) is perfect for jumping right back on when leaving. I would recommend this hotel to friends or family. We have stayed at the Best Western PLUS strawberry for the past three years about 36 times! We have tried other hotels, but we feel that the BW strawberry has to be the best! The rooms are clean, warn and welcoming check in and check out. Wonderful breakfast area and over all a great place to stay. The king suite on the first floor, non-smoking was roomy and well equipped. The bed was extremely comfortable. We liked that the bathroom had a timed heater. The only minor problem was the tub had a dripping faucet. Our check-in was efficient and the breakfast was quite good. I would definitely use this hotel again. 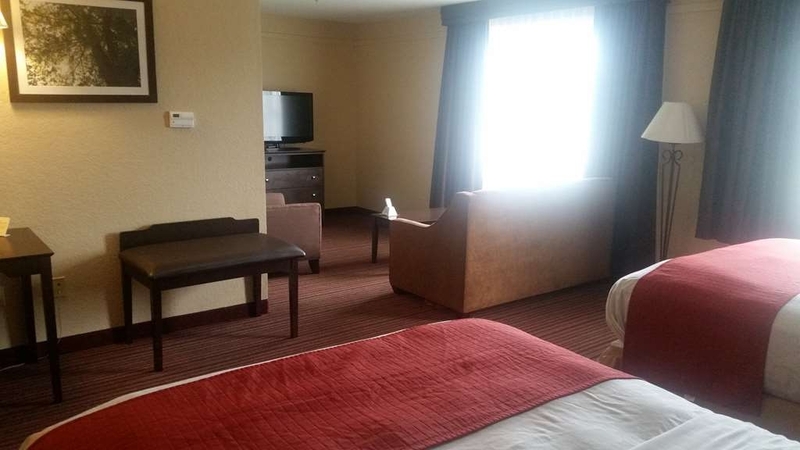 "Hotel stay for the Dixie Classic Poultry show 12-5/6-15"
Wonderful clean hotel. Pool and hot tub were very nice and my family had a good time swimming. Staff was extremely pleasant when we asked for extra towels or blankets. We do not travel much and the thought of bed bugs/roaches scares us and we did a bug check before taking our bags in the room. The room was clean as can be, smelled nice upon entering. That is very important to us. We would stay here again if we come back next yr for the Dixie Classic! 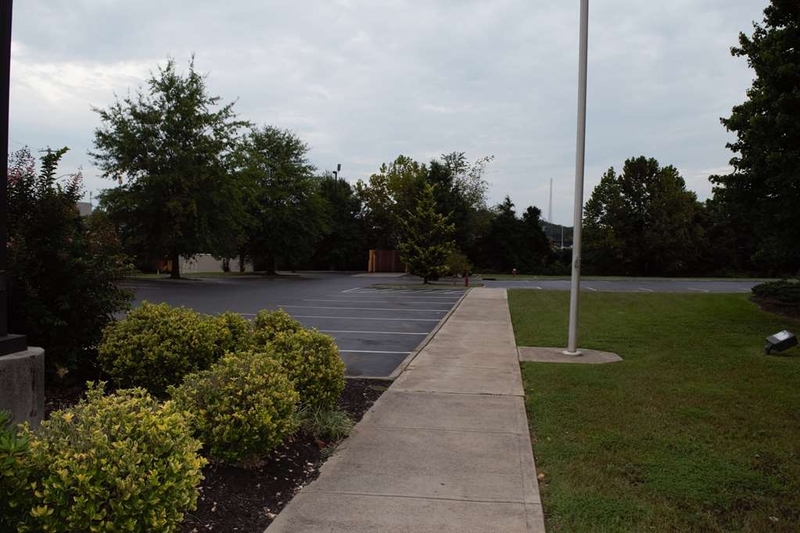 "Great location west of Knoxville"
Good location near highway 40. The facility was overall clean and maintained. Breakfast was typical of other Best Westerns. However, the breakfast staff was wonderful and friendly. The main complaint was the bed, it was worn out. I would not likely stay here again. Beautiful hotel just lacks attention to detail by housekeeping. The night clerk was away from the desk for 10 minutes or more when we arrived. This young woman was annoyed to be asked about a malfunctioning TV remote and did nothing to replenish the lobby coffee. Other than this the property is very nice. "Easy access off Highway 40"
Good location , easy on and off access to highway 40, yet room was quiet with no highway noise..Large room with microwave and refrigerator. We took advantage of the small fitness center available for a morning workout , before a tasty breakfast of eggs, sausage and home fries, plus lots of other choices. Free USA today at front desk. Hotel staff very friendly and welcoming. 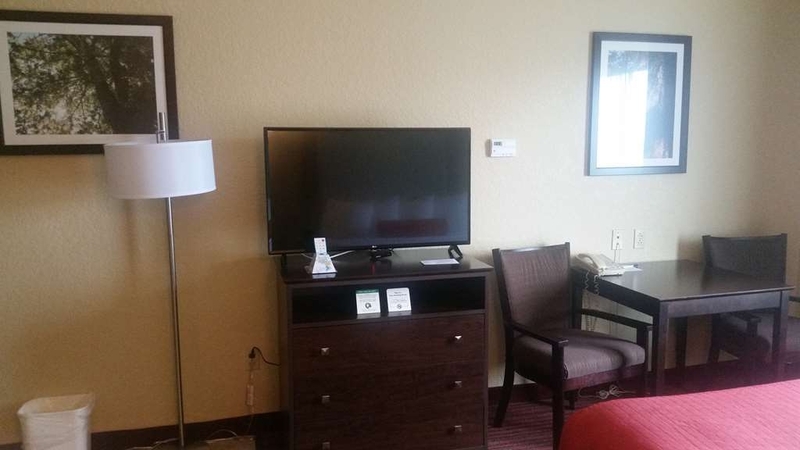 "Great stay and close to amenities for traveling." 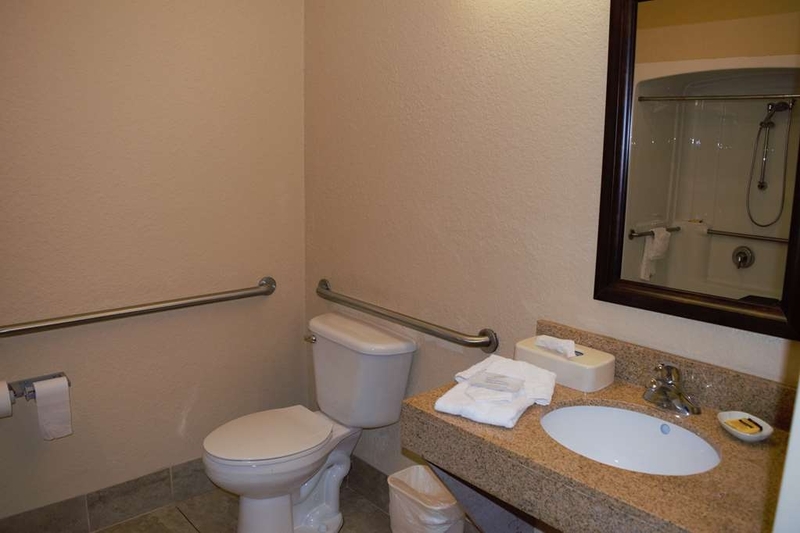 The facility is very nice and convenient to the interstate, gas stations and various restaurants. The staff was very courteous and helpful during check in. The breakfast was very good with variety. The room was VERY nice and the bed comfortable. If you're looking for a great place at a reasonable rate to stay do not pass this up. Hotel appearance was pleasant. Reception staff was very helpful. 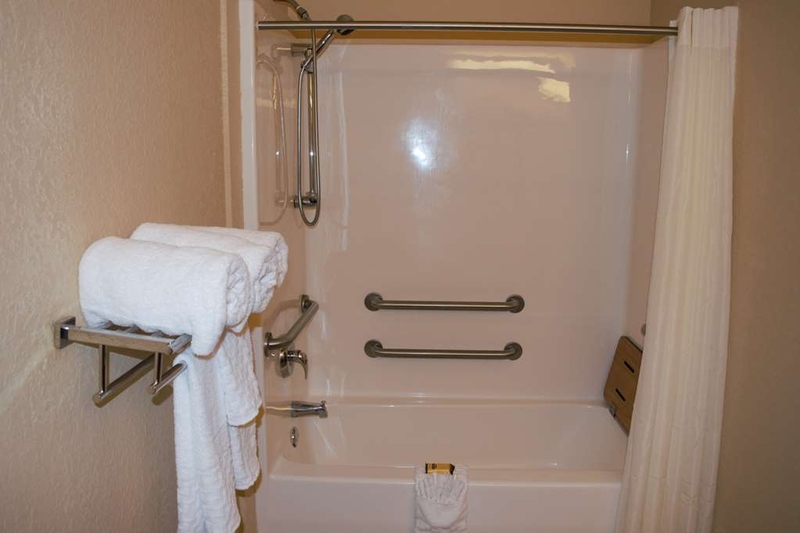 We were traveling with a handicapped person confined to a wheelchair and needed a room to accommodate 3 adults. Explained what we were looking for and asked to view large rooms before committing to staying. This request was met as if it was a normal daily occurrence. Love that! Breakfast and internet were included included in the price. Another plus! This location was not up to the normal standards of a "Best Western Plus". Smokey room, poor mattresses, no hot water, slow internet, no shampoo, sticky hairdryer. There is a new Comfort Inn Suites next door. "Stayed for two nights. Slept just fine." I stayed here with my family for two nights. I was a bit concerned by some of the other reviews, but we had a clean room and shower, and slept just fine. The morning staff was great, my only issue was; my wife asked for a milk for our kid's bottle at night. The evening front desk staff refused to get her a milk. We've never had a problem in any other hotel before asking for milk. We were very satisfied with our stay. Th room was clean and did not reek of cigarettes like many other no-smoking motel rooms I have stayed in. The staff was extremely helpful and courteous. The breakfast was above average. We will stay here again if we are ever in the area. Nothing particularly memorable about the hotel except that breakfast only goes until 9:00 a.m.---kind of an early cut off for leisure travel. The room was nice enough, bed was good but blanket on bed looked like it needed to be replaced. Our toilet was loud upon flushing, but it worked. The lobby has a cigarette smell, hallways too. I'd say this is an average-to-nice quality hotel in a good location for travel and fast food or chain restaurants. Several things wrong with room, like faulty lamp, toilet didn't flush, and beds were old and uncomfortable, and whole ground floor smelled. room rate was more then internet quote. They would not honor one of their own discount coupons we had. The manager said there was a big event in town so he could not honor it, plus we were getting their last room. we watched 3 more people, without reservations, check in after we did. The evening desk staff was not friendly or helpful. We stay at best westerns as often as we can. They always seem so accommodating and very helpful and friendly. Rooms are usually clean and beds comfortable, never a complaint, however this best western was extremely substandard for that chain. Worse stay we've ever had at a best western. Went off other reviews that said this place was nice. Yes, it seems clean but that was the only plus. The beds were extremely flimsy and uncomfortable. The linens were thin, old and rough. Pillows were not plush. The room temperature didn't regulate well and was noisy. My daughter had better bunk mattresses at camp than the poor mattress on the sofa pull-out. I could hear every door that closed in our hall throughout the night...when the noisy air wasn't running. Last, the coffee was horrible. "Excellent Staff/Great, Clean & Spacious Rooms"
The staff here is very kind and helpful, with only your wants and needs in mind. They offer excellent customer service and check you in and out in an quick & efficient manner. Rooms are clean and well stocked. They also have a Rewards program that you should check out as well! This was one of the best hotel we have stayed in. Everything was excellent. If all best western hotels was like this one we would use more often. The rooms where clean and the beds where very comfortable. Very friendly staff. The staff was very informative of the accommodations and amenities. The King Suite was an excellent value. The hotel has non-smoking and smoking rooms. Non-smoking was very nice. Smoking rooms smelled strongly of smoke. We opted for a smoking room due to limited availability in the area. Our family had a block of 9 rooms, and they were able to keep us all together, even with a big football game that weekend! Rooms were nice and spacious, with a mini fridge and microwave. The night desk clerk, Daniel, was awesome! Our family gathered in the commons, after the wedding, and he was helpful in ordering pizzas, and was an all-around gracious host! Housekeeping staff was very friendly, and made you feel welcome! I would recommend this hotel! I booked my reservation threw price line, because I had death in the family, however when I called and spoke to Amy she stated if I needed an handicap accessible room it would be an additional $95, and if I needed to check in before 3 it would an additional room charge. When I arrived at the hotel I was greeted by a beautiful lady name Laura. She informed me that she had to redo / fix my reservation because Amy had took my room for herself knowing I needed a handicap accessible room. She apologize and couldn't understand why an employee would take a guest room for herself. Laura did get us checked in early. There were a few pleasant employees Debbie (housekeeping ), Elizabeth (cook), Laura (front desk). I'm real big on customer service and Amy ruined this already unpleasant visit for me. It doesn't take much to please a guest, however it's easier to lose guest with unpleasant attitudes. We stayed one night on the way to the Myrtle Beach. The hotel was clean, the staff friendly and check-in was quick and efficient. Our room was number 220 at the end of a corridor. It is next to the exit that leads down to the pool. Convenient if you have children. We were afraid there would be noise from constant slamming of exit door, but we had no problem with it during our visit in the off season. Our room had one king bed, which was comfortable. The free wifi was adequate, but there was also an Xfinity hotspot available for us to choose. I was impressed with the quietness of the air conditioning unit. My husband loved the workout room since he always uses a treadmill. It was in great shape and we noticed the reclining bike, free weights and bench were also in good condition. Breakfast was good, hot, and area kept clean. Only exception to our stay: the pool was fine, but the hot tub did not work at all. There was no sign posted about it being under repair. Cracker Barrel restaurant was just across the highway intersection. Burger King and KFC are next door. "Favorite hotel on this trip"
This is in a good location, for me, east of Knoxville. There are restaurants and gas here too. The room has the fridge and microwave I now expect. I always use a fridge and never the microwave. There is an indoor pool, workout area and computers, but I didn't use them. The wifi is fine but the instructions for username / password weren't clear. They recommended a restaurant next doorish which I loved. When I came in they told me to park my Harley under the portico roof which is much appreciated. I was traveling home from a visit in VA. Stopped for the night with no reservation and was able to stay at the Strawberry Inn, Knoxville. It is a beautiful hotel and very clean. Staff is friendly. Breakfast was usual breakfast fare and fine. I would definitely stay here again. We travel to Tennessee on a regular bases to visit our son at the University. For the past three years we have stayed in this hotel more than 50 times and I can say we have never had a problem! It is like visiting with your family when we arrive! Great location: near the shops and downtown at a much better price.